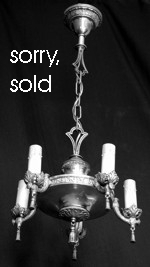 Our fixtures are not reproductions. 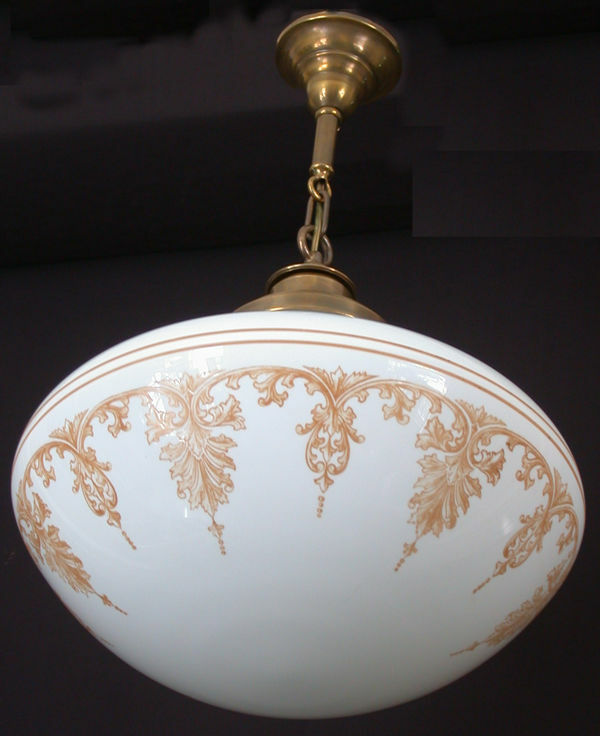 To view Inverted Domes or Electric Lighting Bowls To view lanterns and hall lights. 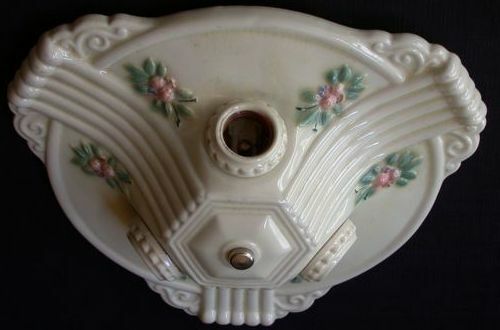 Porcelain fixtures. Flush Mounted fixtures. 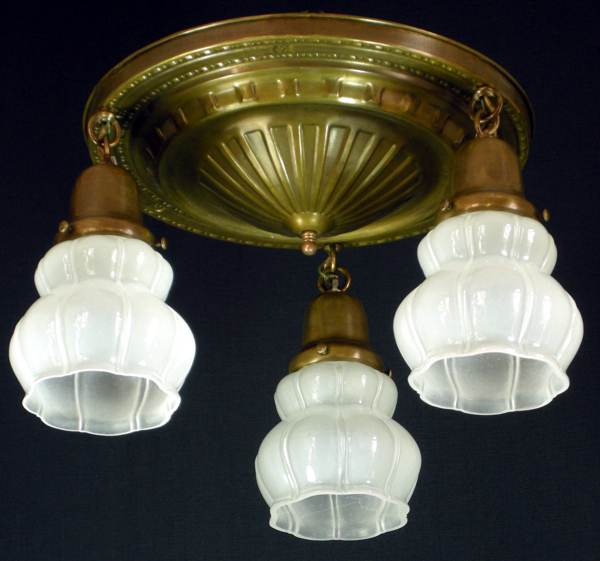 Item# E 011223 A circa 1905 solid brass fixture shown with Alabaster glass shades by Bournique of Kokomo Indiana, circa 1907. It retains flat key switches so it can easily be used in applications where a wall switch is not present. It can, of course, be used with a wall switch too. The drop is presently, 23 inches the spread is 19. Should you wish the drop can be altered to meet your requirements. 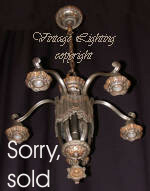 As shown the fixture is available for $ 595.00 plus shipping. Questions? To order email or call. 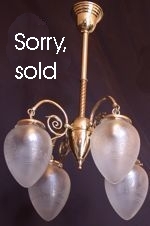 905-885-2344 Item# E 011216 is a three light version of this same fixture. 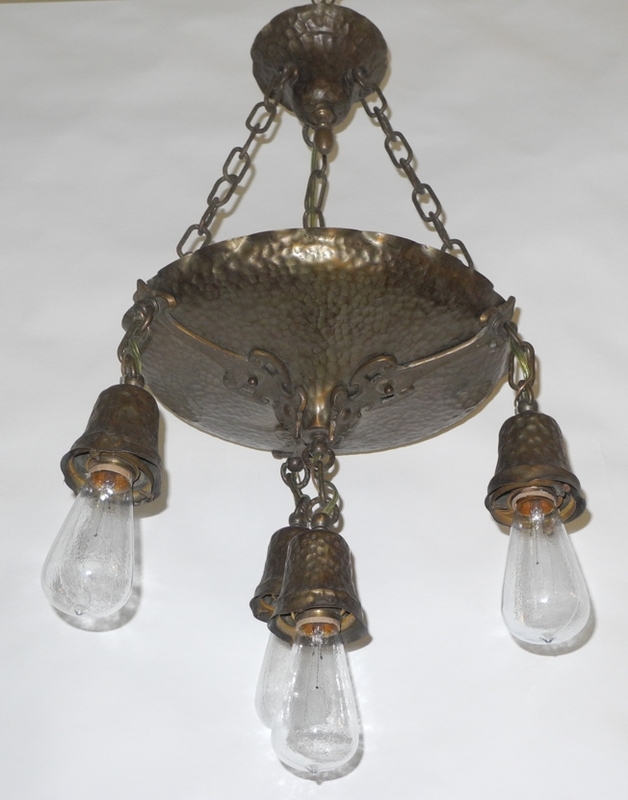 Item# FM Or E 011211 A three light shower fixture shown with the original aged brass finish circa 1920. Shown with Carnival glass, hand painted, castle shades which were made in Czechoslovakia circa 1910. 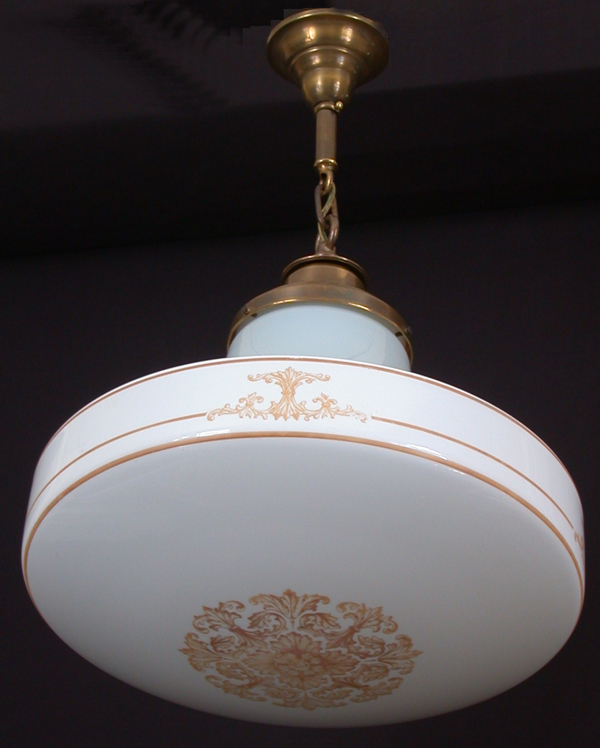 The drop as a flush mounted fixture would be 10 inches. The spread is 16 inches. The drop can be increased or decreased as shown above to meet your requirements It is shown here with a 19 inch drop. 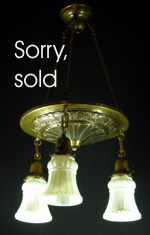 As shown the fixture is available for $ $795 plus shipping. Questions? To order email or call. 905-885-2344. 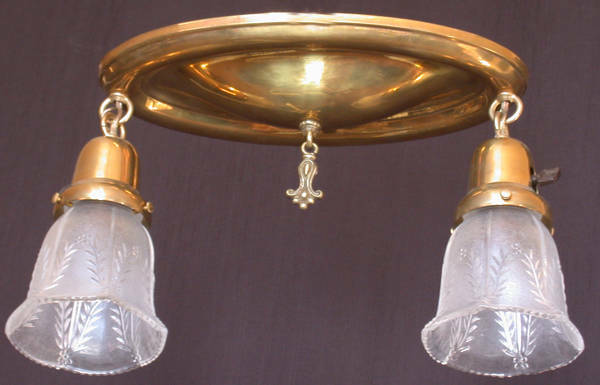 Item# FMBB 102001 We have a pair of these cast iron flush mounted fixtures. They are signed Alywin. 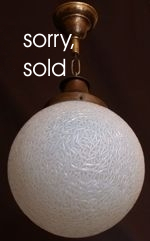 They take Edison based bulbs. They drop a mere 2 inches and the spread is 11 inches. As shown the pair is available for $195.00 plus shipping. Questions? To order email or call. 905-885-2344. 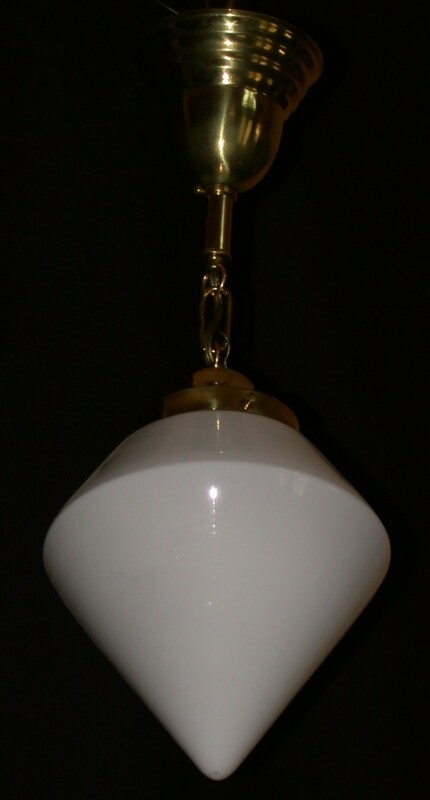 Item# FM 011205 A solid brass two light flush mounted fixture shown with signed Jefferson reverse painted shades. 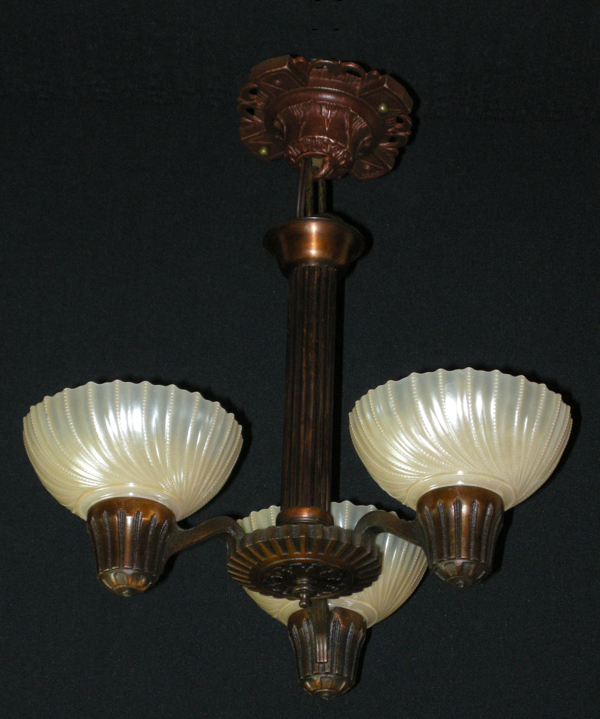 The single fixture below has a larger shade in the same pattern. As shown the flush mount has a 10 inch drop and 15 inch spread. It is available for $295.00 plus shipping. Questions? To order email or call. 905-885-2344. 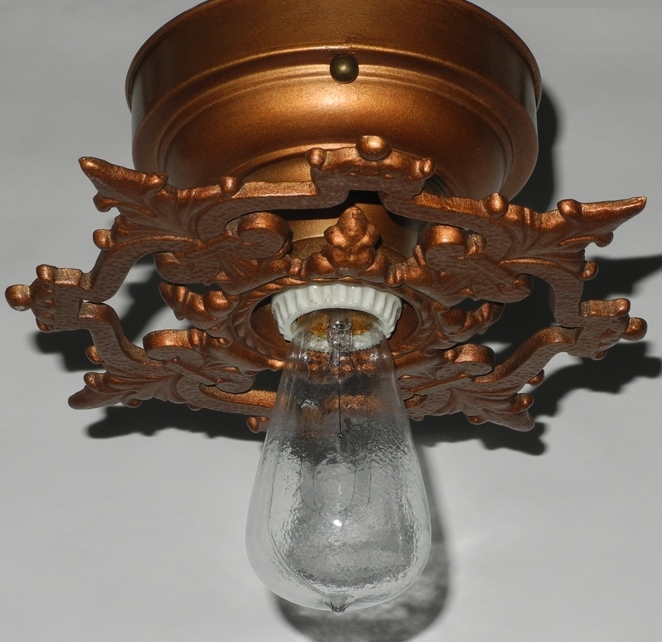 Item# E 09243 The fixture is cast brass foliate ornamented single light fixture circa 1915. 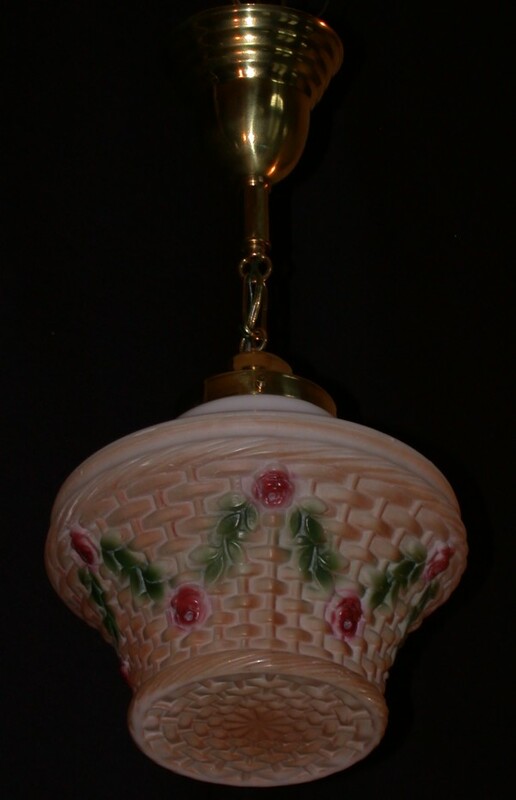 The shade is reverse painted with blown out pattern in basket weave and floral vine. 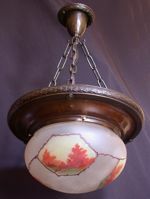 Matching signed Jefferson shades on the two light flush mount above. The drop is 10 inches. The spread is 9.5 inches. 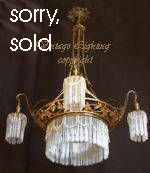 As shown this fixture is available for $350.00 plus shipping. Questions? To order email or call. 905-885-2344. 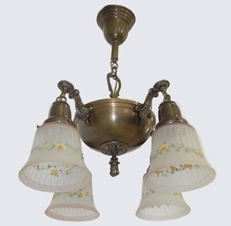 Item# FM 011213 A three light flush mounted fixture shown with the original aged brass finish. The Sheffield shaped shades are inside etched so they have a very reflective glossy surface. The drop of this fixture is 19 inches the spread is 14 inches. As shown it is available for $395.00 plus shipping. Questions? To order email or call. 905-885-2344. 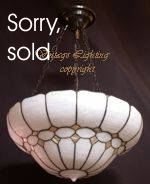 Item # EP 0012131 This five light pan fixture is shown with replacement frosted shades. The drop is shown at 23 inches, this can be increased, and the spread is 21 inches. 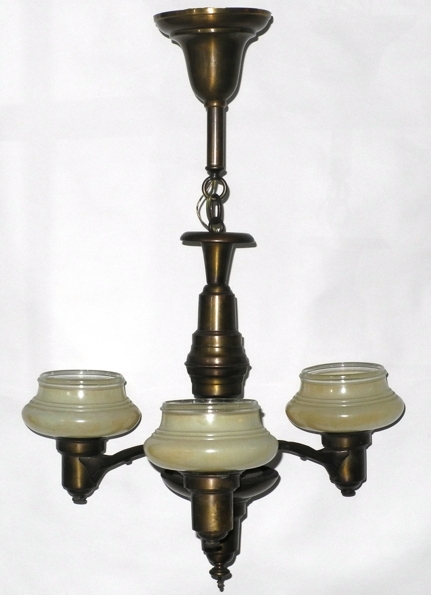 Item # E 0981 A four light mission fixture circa 1910 fitted with pale caramel and cream slag glass shades. The drop is presently 28 inches the spread is 22 inches. 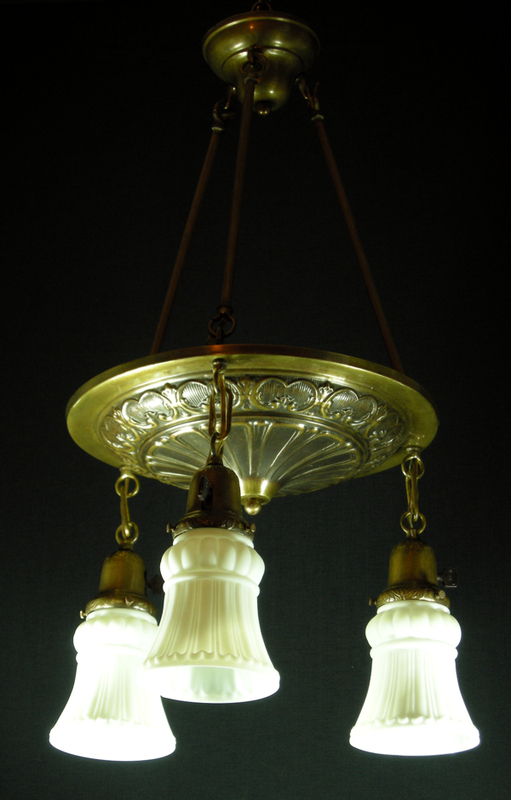 Item # L 250 A large opalescent glass shade is shown here with an original period aged brass fixture circa 1920 . The drop is 23 inches and the spread is 12 inches. The drop can be increased to meet your needs. 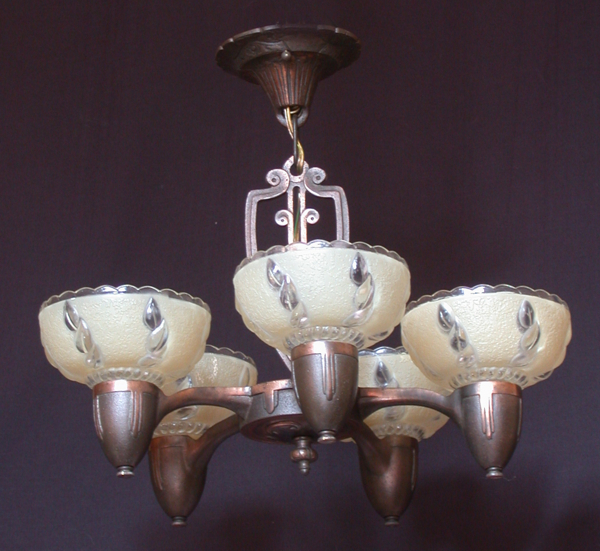 Item # E 11072 A Lightmaster five light fixture circa 1936. 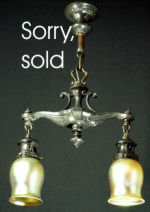 Shown with the original hobnail fonts, clear and frosted shades and original finish. 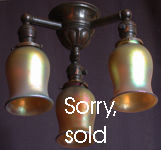 We have another matching five light fixture, two pair of matching pair of wall sconces and a matching hall light available. The fixtures have a drop of 25 inches and a spread of 18 inches. 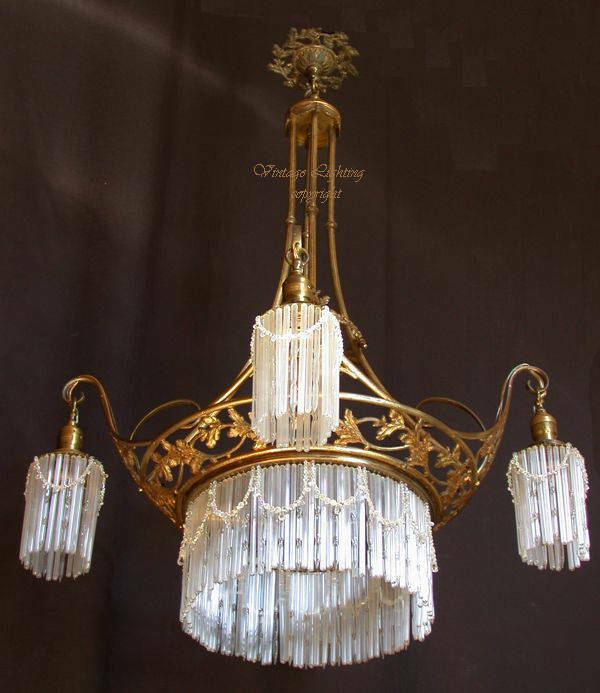 As shown it is available for $575.00 plus shipping. 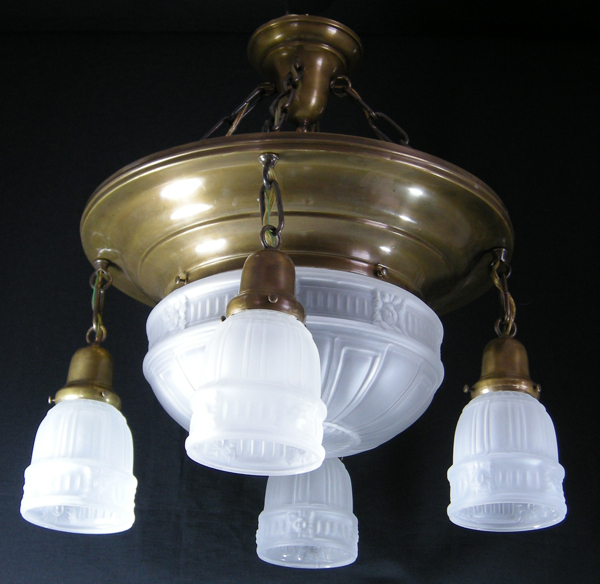 Item # ES 0432 We have one these three light solid brass fixtures. The drop is shown here at 19 inches. The spread is 13 inches. 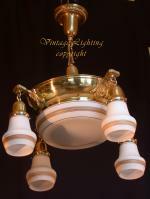 This fixture can also be mounted as flush mounted fixture. 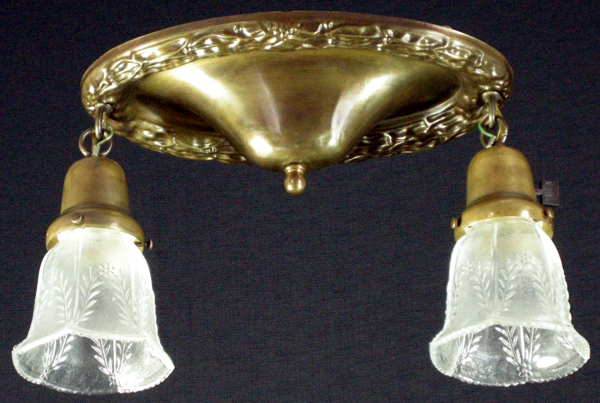 Item# FM 011206 A two light flush mounted fixture shown with the original aged brass finish. 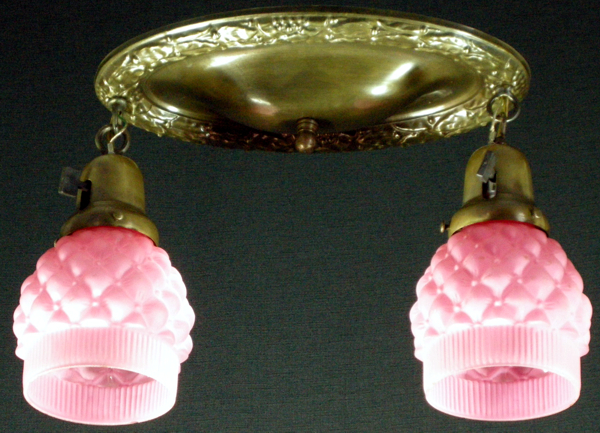 The pink shades have a button tufted pattern and reeded edge and are of the period of the fixture. The sockets retain their charm by the use of new replacement paddle key switches. 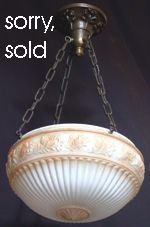 The drop of this fixture is 9 inches the spread is 15.5 inches. 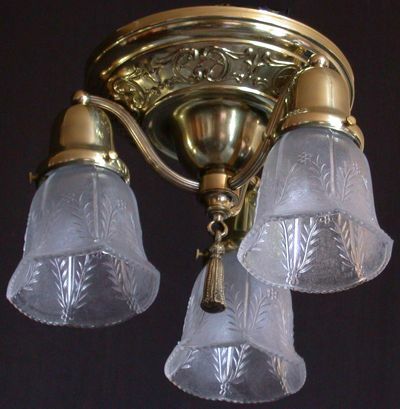 Item# E 011216 A circa 1905 solid brass fixture shown with glossy white shades in a Sheffield pattern of the period. It retains flat key switches so it can easily be used in applications where a wall switch is not present. It can, of course, be used with a wall switch too. The drop is presently, 22 inches the spread is 20.5. Should you wish the drop can be altered to meet your requirements. 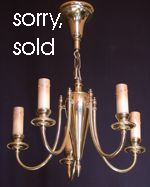 As shown the fixture is available for $ 695.00 plus shipping. 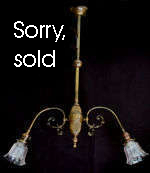 Item# E 011223 is a two light version of this same fixture. 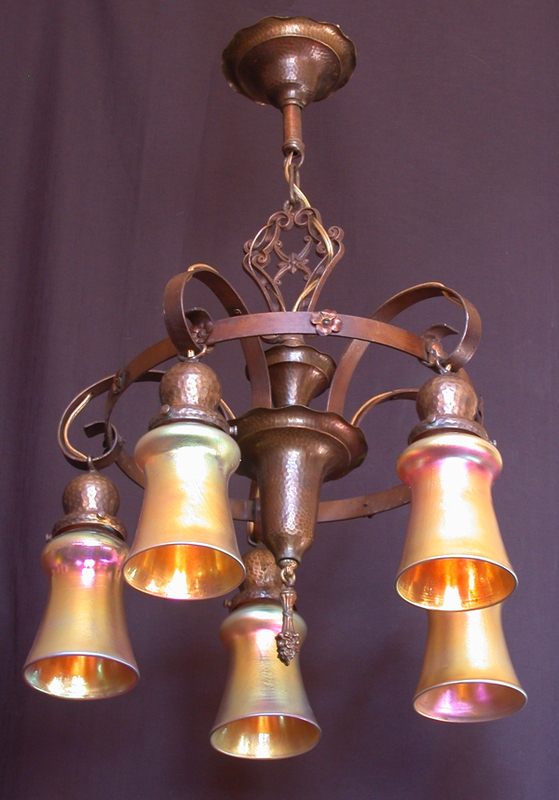 Item # L 09164 A hammered brass lantern with curved glass caramel slag panels. The drop is 25 inches as shown and the spread is 7 inches. The drop can be adjusted to meet your requirements. 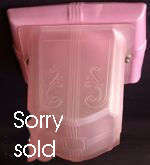 As shown it is available for $255.00 plus shipping. 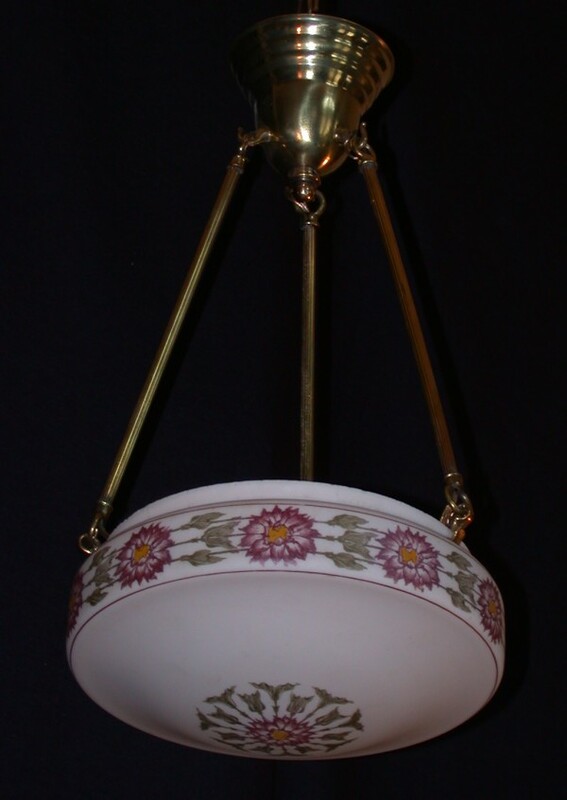 Item # EP 09195 We have a matching pair of these five arm pan fixtures circa 1910 with their original silver polychrome finish and brass highlights. 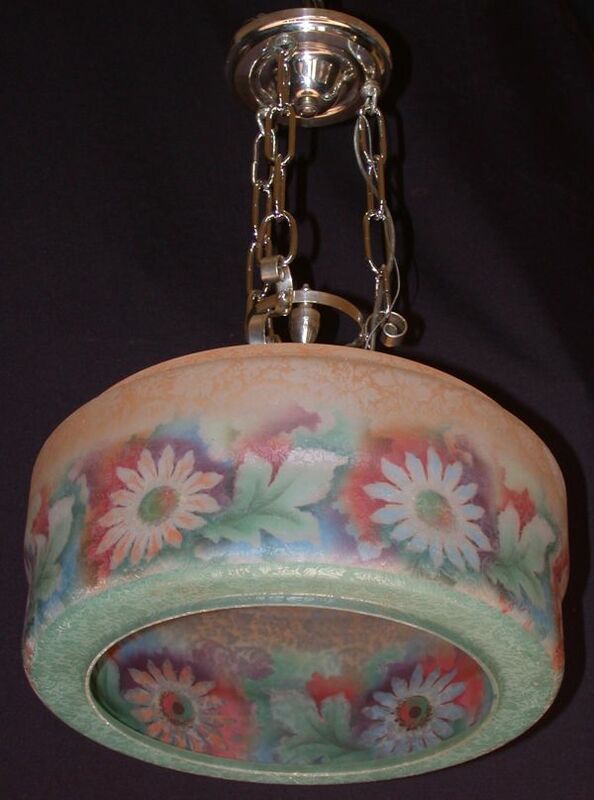 Shown here with pressed glass daisy and garland shades. The drop is presently 24 inches, this can be increased to suit your requirements. The spread is 16 inches. They have flat key switches so they can easily be used in applications where a wall switch is not present. They can of course be used with a wall switch too. 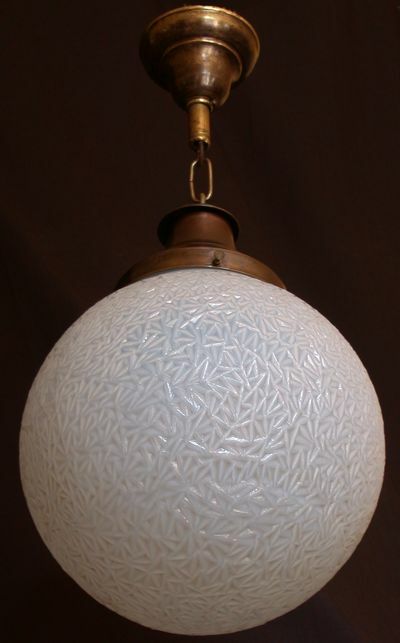 Item # L 10211 A single light fixture circa 1910 with the original stencilled white glass shade. Cast brass trefoil loop finial and crown on fitter. The shade has a 12 inch spread. The drop is presently 34 inches. 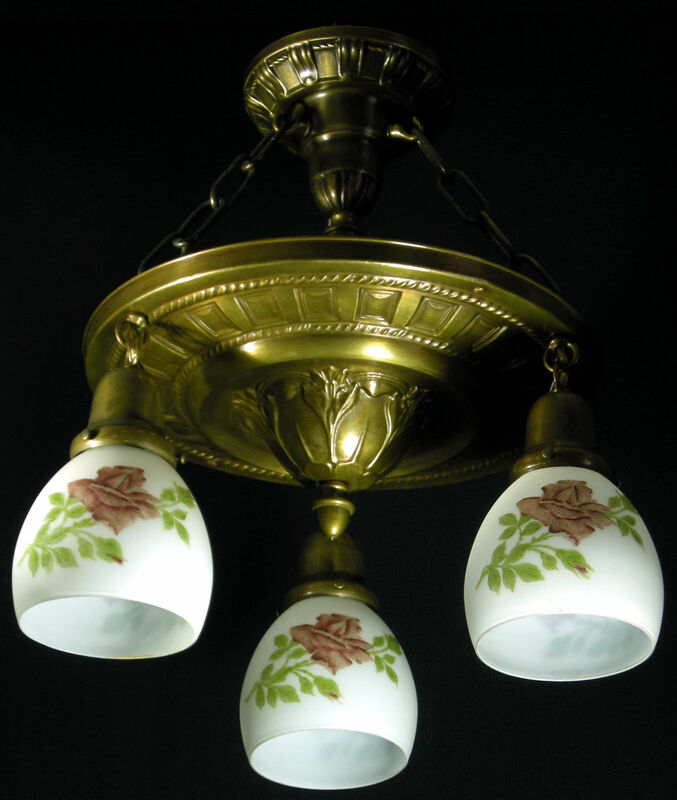 This can be increased as required. .
Item# FM 011207 A two light flush mounted fixture shown with the original aged brass finish and daisy and garland patterned pressed glass shades. The sockets retain their charm by the use of new replacement paddle key switches. 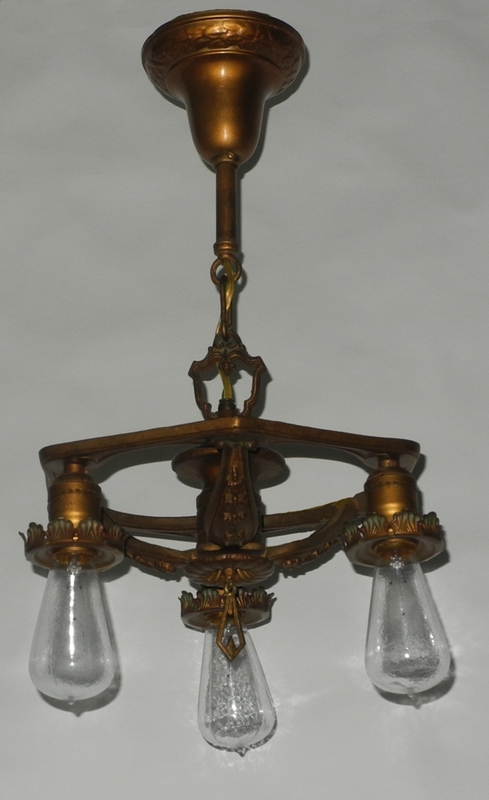 The drop of this fixture is 8.5 inches the spread is 13 inches. Questions? To order email or call. 905-885-2344. 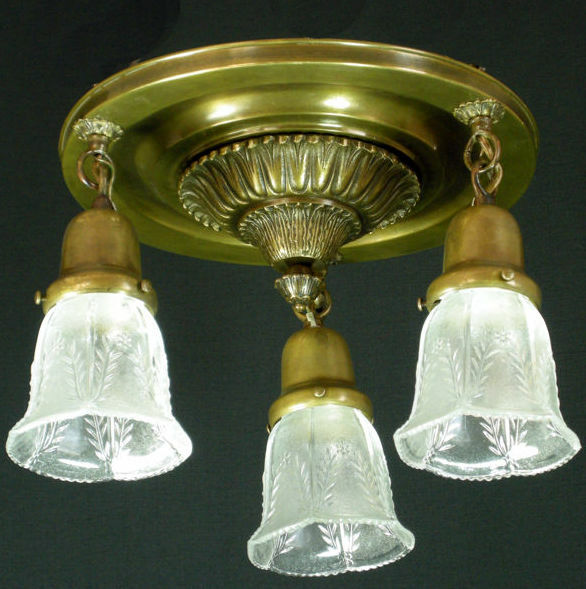 Item# E 011221 A solid brass three light fixture circa 1900 shown with pressed glass shades in a star pattern. The drop is presently, 16 inches. This can be increased if required. The spread is 16 inches. The sockets retain their charm by the use of new replacement paddle key switches, so it can easily be used in applications where a wall switch is not present. It can, of course, be used with a wall switch too. 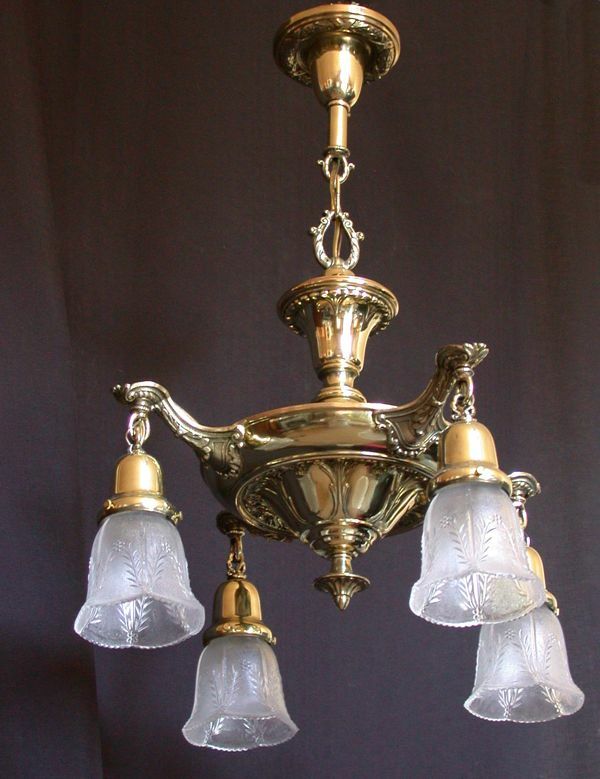 Item# E 011202 A solid brass two light pendant fixture circa 1900, shown with daisy and garland patterned pressed glass shades. The drop is 25 inches and the spread is 21 inches. 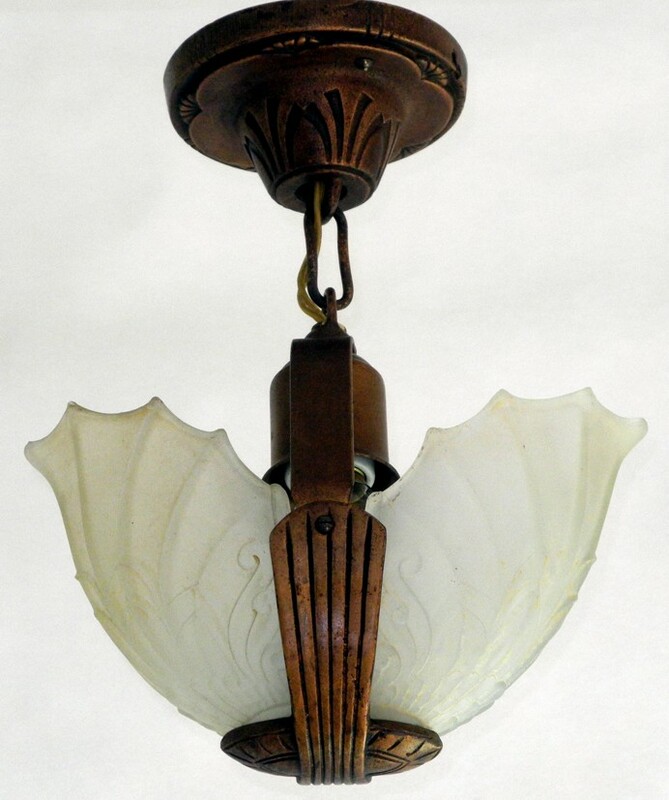 Item# FM 011215 A four light flush mounted, Sheffield fixture shown with the original aged brass finish and inside etched Sheffield patterned glass shades. 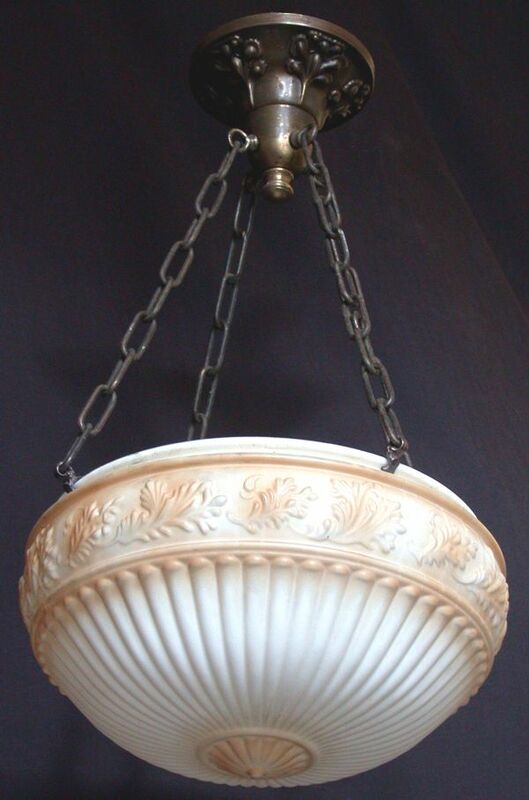 The drop of this fixture is 11 inches the spread is 13 inches. 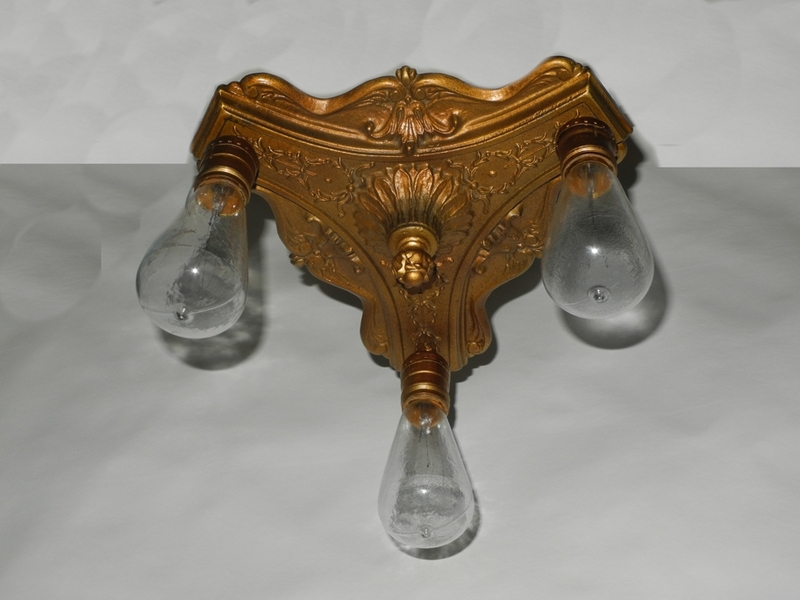 Item# E 011224 A solid brass three light fixture circa 1910. 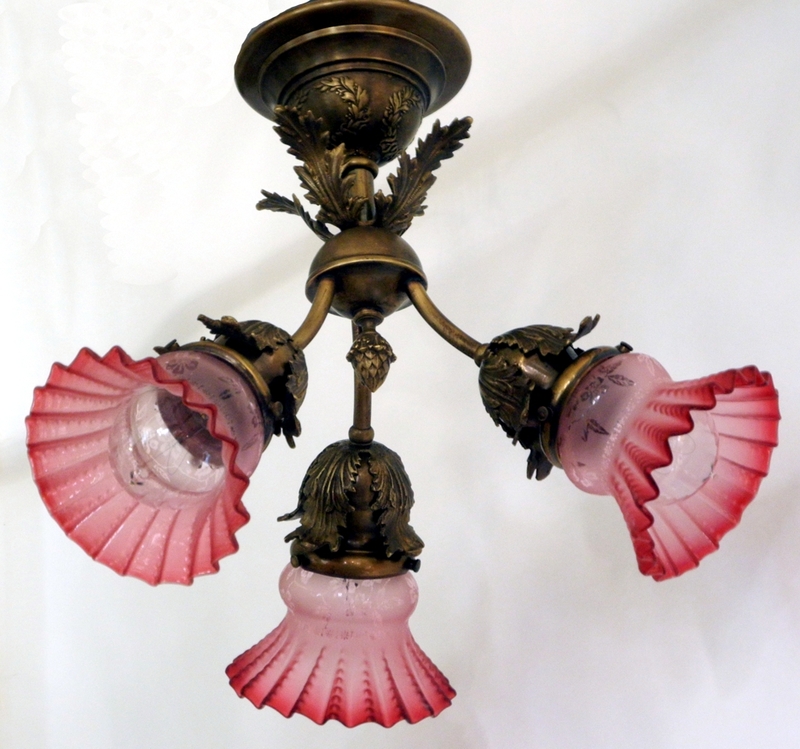 Shown here with Artisanal, American art glass, gold pull feather decorated, tulip shaped replacement shades. There is foliate detailing on the arms. The sockets retain their charm by the use of new replacement paddle key switches, so it can easily be used in applications where a wall switch is not present. It can, of course, be used with a wall switch too. The drop is presently, 16 inches the spread is 17. Should you wish the drop can be altered to meet your requirements. 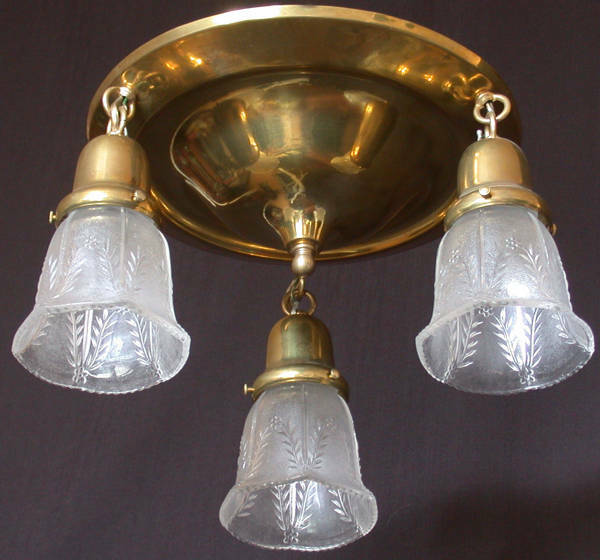 Item # ED 09161 A five light slipper shaded fixture circa 1920. Cast glass amber shades resting in a polychromed metal frame. The drop is shown at 24 inches. The spread is 16 inches. 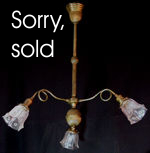 Matching slipper shaded sconces are also on offer. 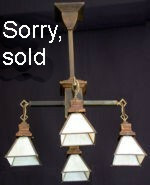 As shown the five light fixture and matching pair of sconces are available for $1600.00 plus shipping. 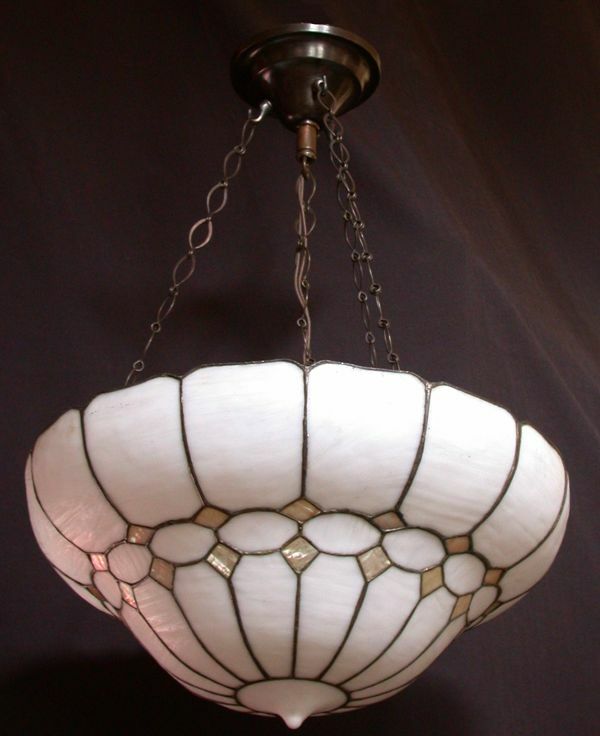 Item # ELB 162 An Edwardian curved glass inverted dome fixture. 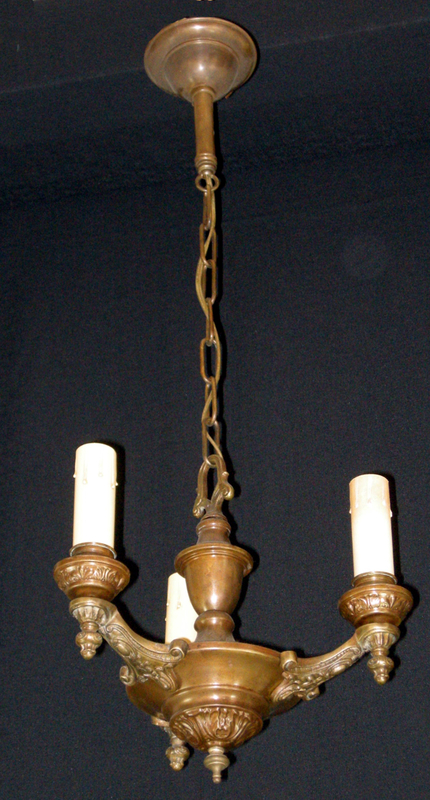 Shown here with a dark aged brass fixture and hand made chains. 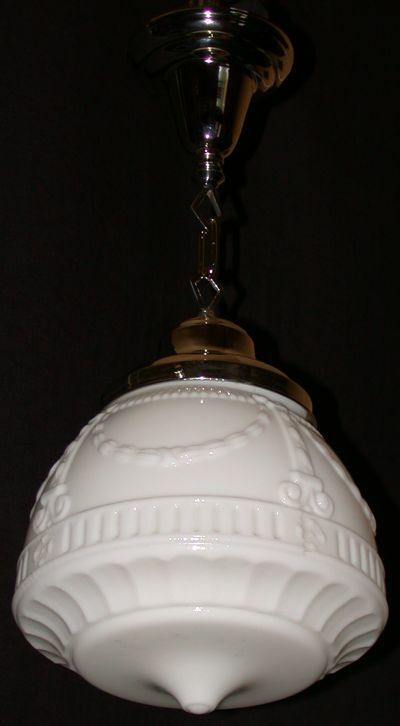 The dome has mother of pearl insets. The drop is shown at 28 inches the spread is 18.5 inches. The drop can be altered to meet your needs. 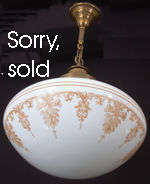 As shown the inverted dome fixture is available for $925.00 plus shipping. 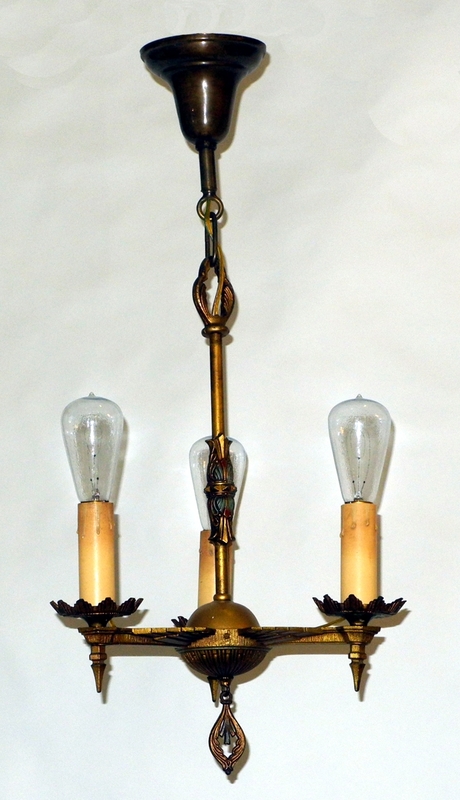 Item # EP 09194 This three light pan is shown with the original three candle sockets and finish. Should you wish these can take fabric shades. The drop is presently 31 inches the spread is 13 inches. This fixture takes normal Edison bulbs not chandelier. .
Item# E 09242 A little three light fixture circa 1910. 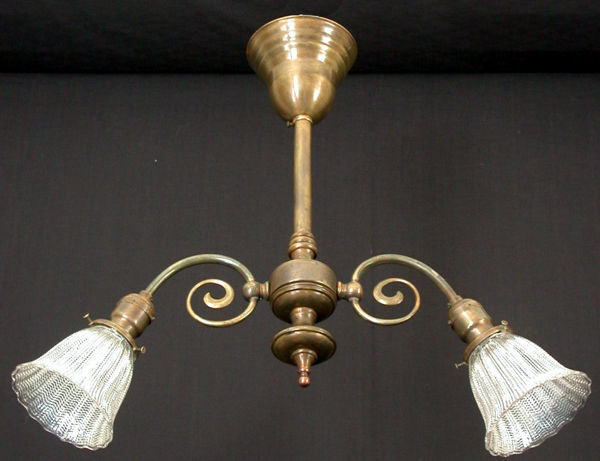 Solid brass and ideal for a low ceiling in a small hall, pantry, cloakroom, or closet. The drop is presently 16.5 inches this could be decreased to 13.5 or 14 inches if necessary. The spread is 11 inches. 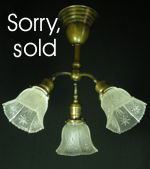 The fixture is shown here with pressed glass shades in a daisy and garland pattern. 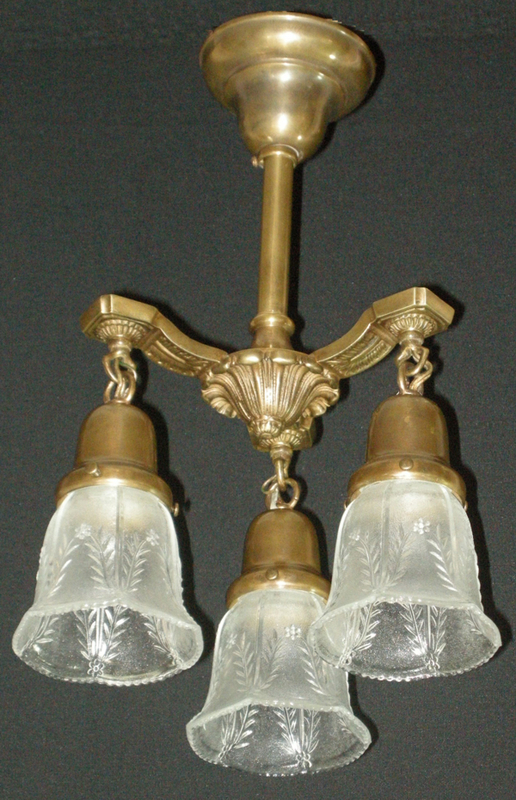 Item # E 09165 A three light circa 1910 solid brass fixture with cast brass arms, loop finial and finial. Shown here with artisanal, American made, art glass, replacement shades. The green feathers are outlined in gold. The drop is 26 inches and can be increased to meet your requirements. The spread is 18 inches. 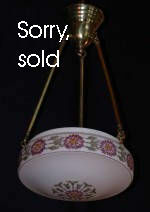 Item# E 011208 This fixture is proving to be especially difficult to photograph. Please bear with me. 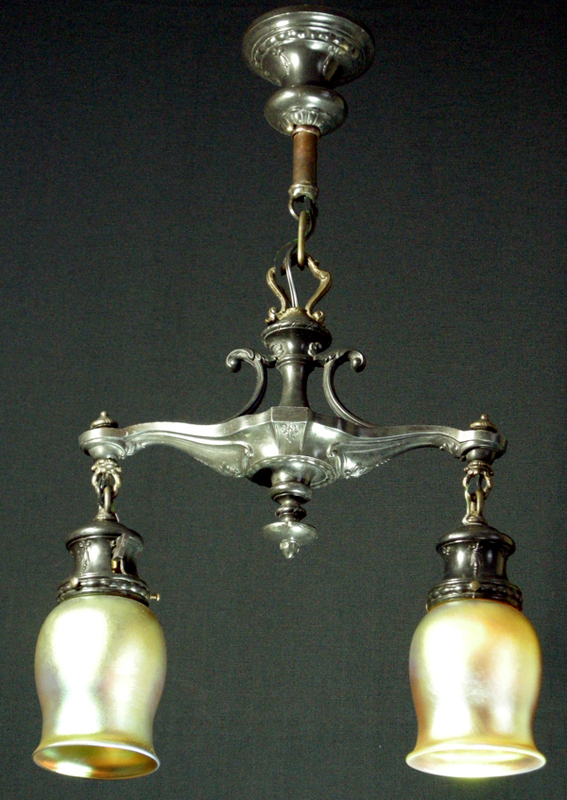 The fixture circa 1910 is blackened Spelter the detail is particularly crisp. 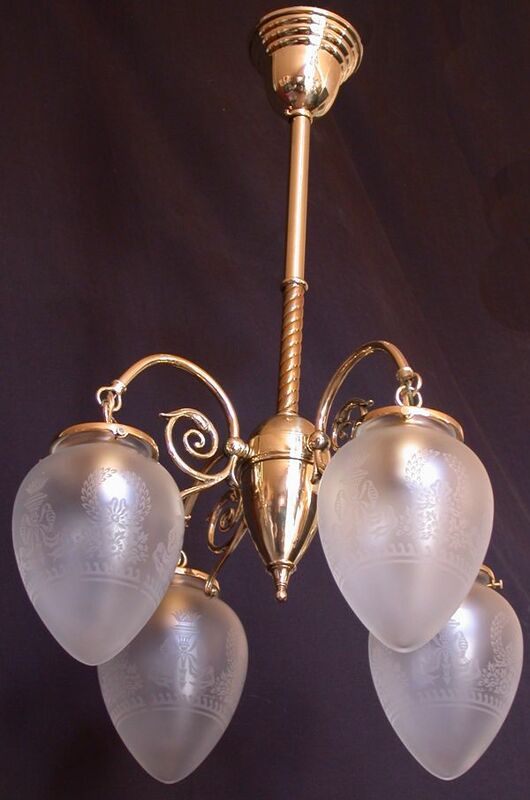 Shown here with Artisanal, American art glass, gold iridescent tulip shaped replacement shades. The shades are those shown here. The drop is 24 inches and can be increased to meet your requirements. The spread is 15 inches. 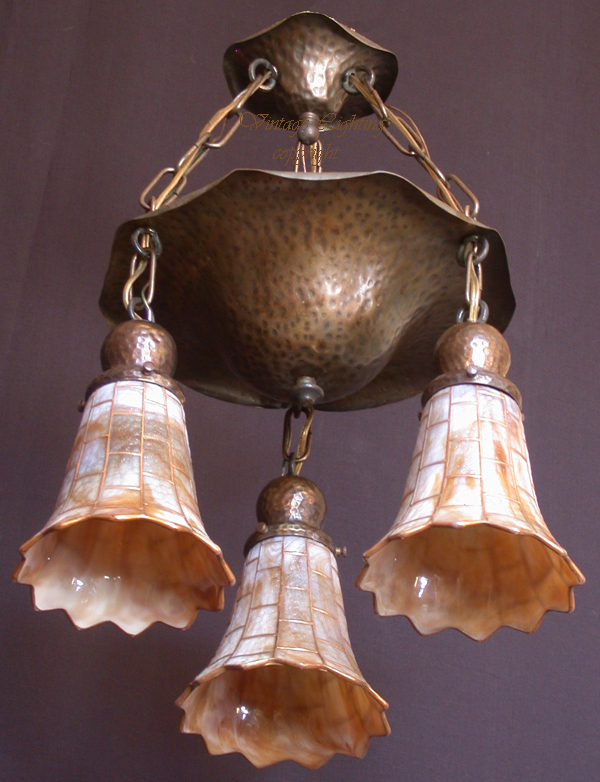 Item# E 09244 A copper wash three light fixture with pale gold iridescent glass shades 1930s. The drop is 17 inches and the spread is 15 inches. The drop can be increased to suit your requirements. 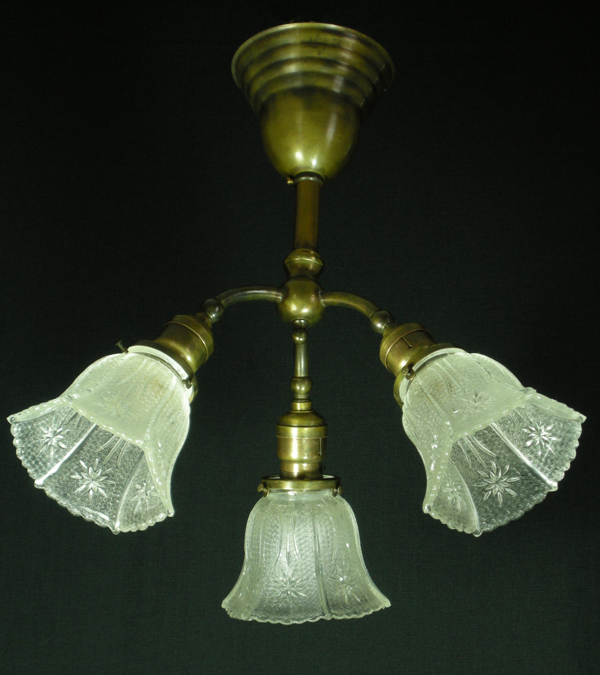 Item # E 09125 An early 1900 electric, three armed fixture with reeded details, shown with period pressed glass shades. 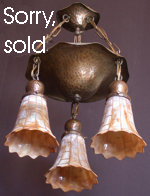 A matching two light fixture is also available. The drop is presently 32 inches and the spread is 24 inches. 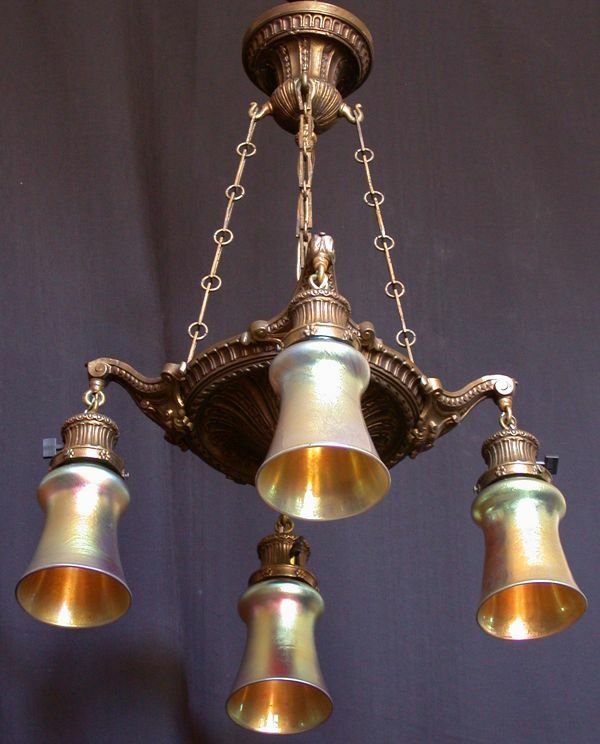 Both fixtures have an aged brass finish. 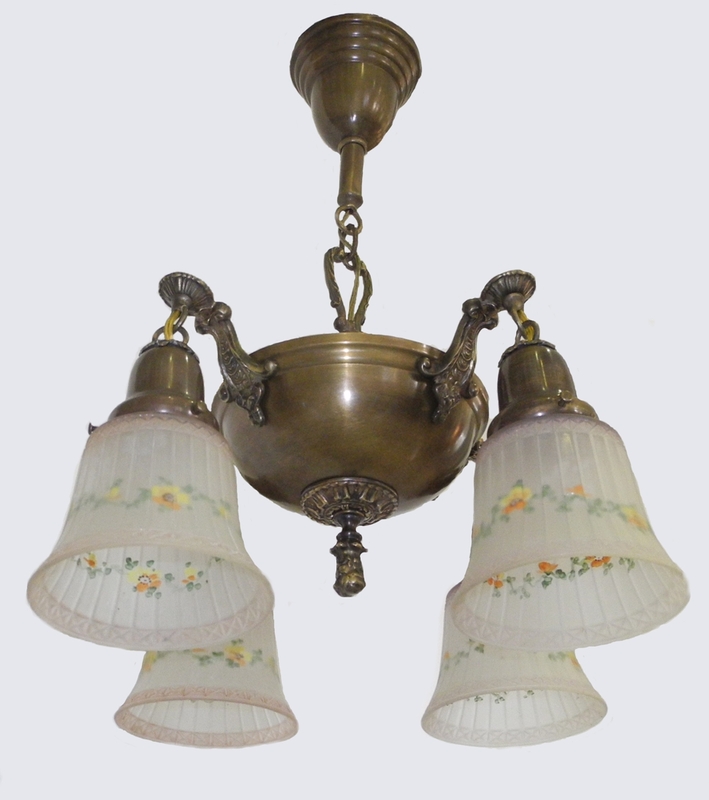 Item# FM 011212 A three light flush mounted fixture shown with the original aged brass finish and daisy and garland patterned pressed glass shades. 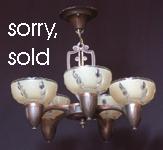 The drop of this fixture is 10 inches the spread is 15 inches. 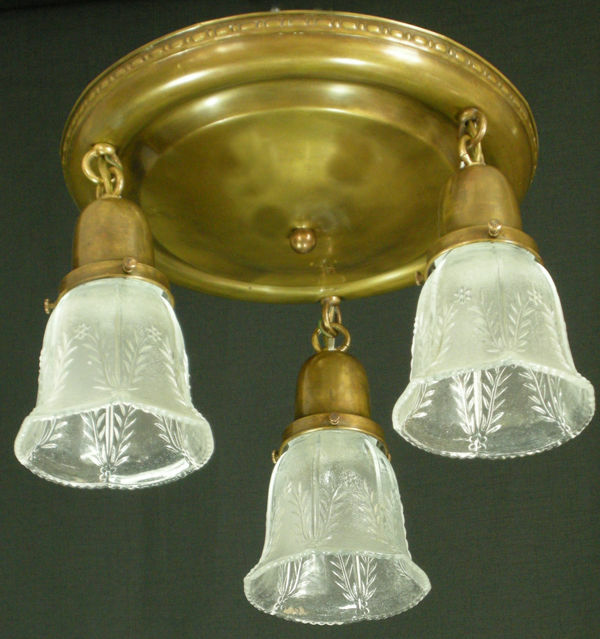 Item # EP 011204 This two light solid and cast brass pan fixture is circa 1910, shown with daisy and garland patterned pressed glass shades. The drop is presently 20.5 inches, the spread is 17. The drop can be increased to meet your requirements. Item # L 121 Hall lantern with bevelled glass panels cover a two light fixture. 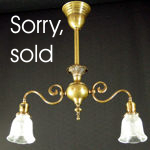 The frame is solid brass in original aged brass finish. The drop is 26 inches. The spread is 11.25 inches. There are two chips on one panel. One at the bottom left corner and one near the top right corner. 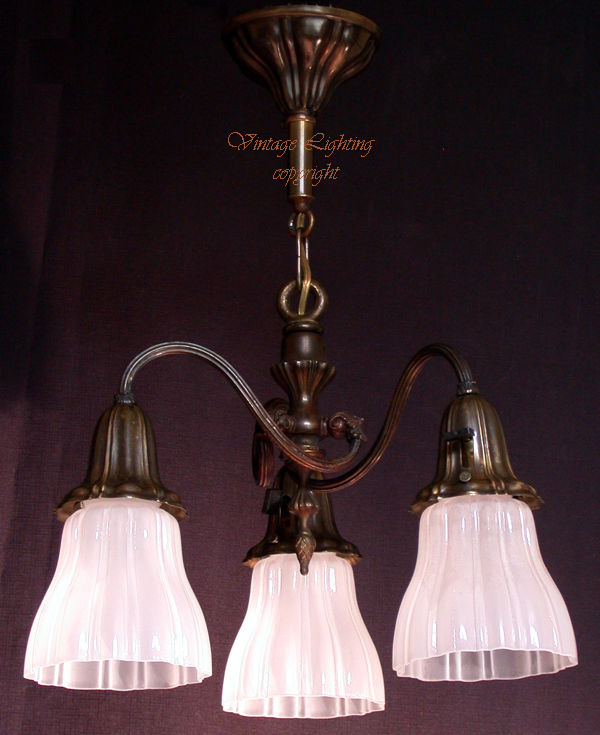 Item# G 09199 A three light gas fixture which has been fitted for electricity in a light bronze colour circa 1900. It is shown here with period Botanical print in frost and yellow. The drop is presently 31 inches. The spread is 15 with this set of shades. To view the fixture with an optional set of period shades, botanical print cornflower patterned, follow this link. Close up of the shade is available here. Item # E 11073 Fine quality is apparent in this five light cast bronze, circa 1910 fixture with the original nickel finish with small gilded highlights. Presented with linen fold detailing on central crown, canopy and bobesche. 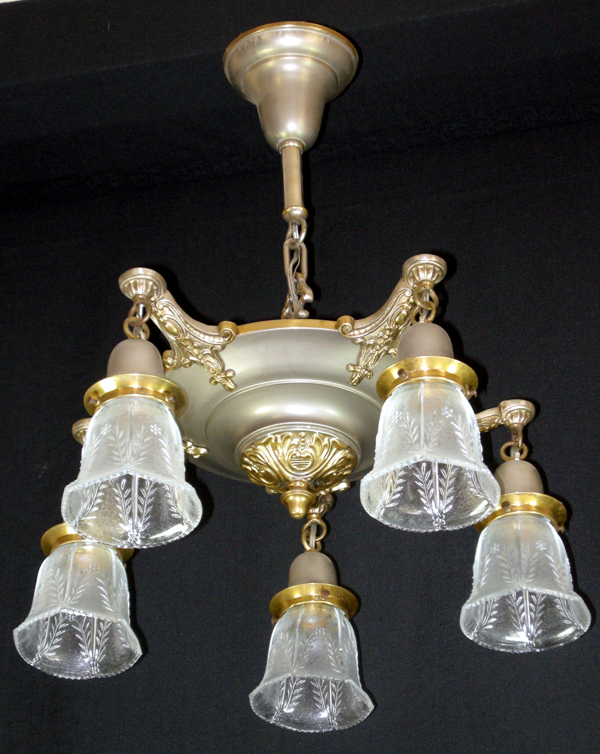 The drop of this fixture is 38 inches and the spread is 21 inches. 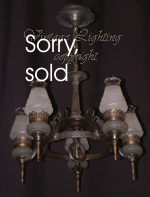 The fixture is signed S & A Co.
Item# FM 011203 A two light flush mounted fixture shown with the original aged brass finish and daisy and garland patterned pressed glass shades. The sockets retain their charm by the use of new replacement paddle key switches. 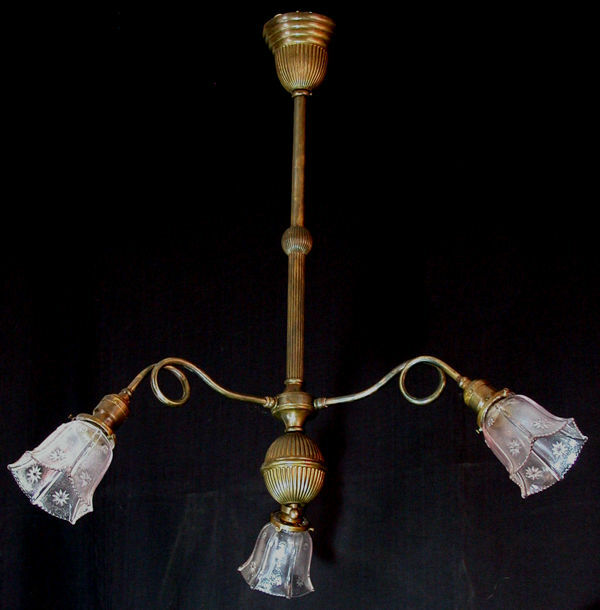 The drop of this fixture is 9 inches the spread is 15 inches. 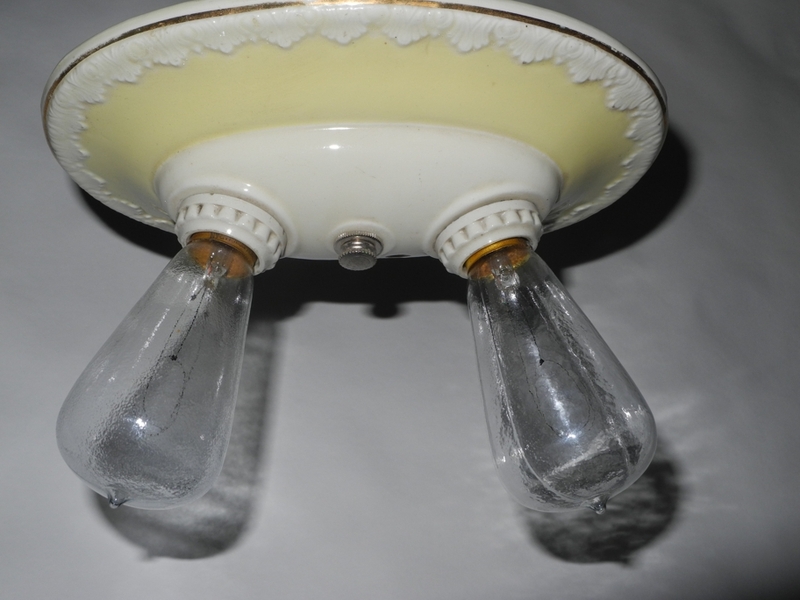 Item # E 01211 A three light shower fixture which is rod hung and shown with period white bisque glass shades circa 1910. 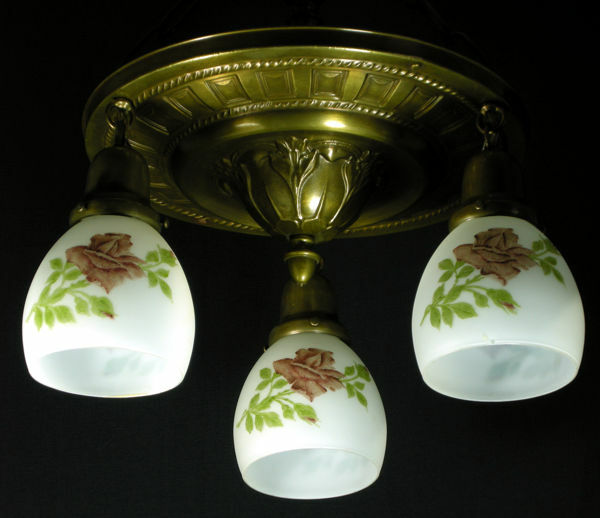 The fixture can also be made to be used as a flush mounted fixture. Presently the drop is 28 inches. The spread is 15 inches. 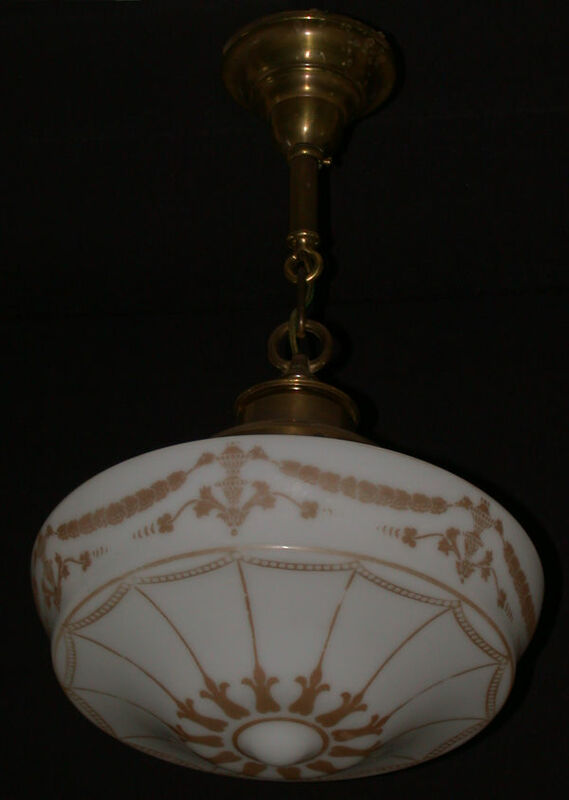 As a flush mounted fixture the drop would be 11 inches. As shown it is available for $495.00 plus shipping. 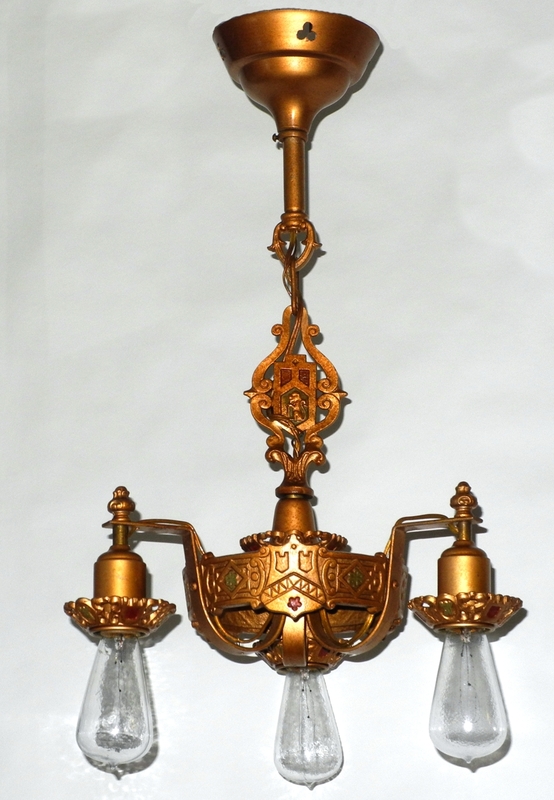 Item# FM 011214 A three light shower fixture shown with the original aged brass finish circa 1920. Shown with daisy and Garland patterned pressed shades. 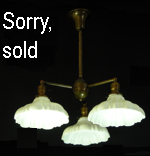 The drop as a flush mounted fixture would be 11 inches. The spread is 13 inches. The drop can be increased or decreased as shown above to meet your requirements. 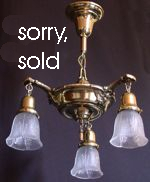 Item # E M 046 A solid brass two light mission fixture with original caramel slag glass panelled shades circa 1910. The drop is 18 inches and the spread is 19 inches. 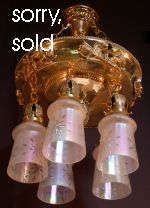 Item # L 155 This large white glass shade is shown the original period aged brass fixture circa 1920 . The drop is 25 inches and the spread is 12 inches. The drop can be increased to meet your needs. 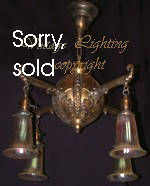 Item # E 09131 We have two matching two armed fixtures available. 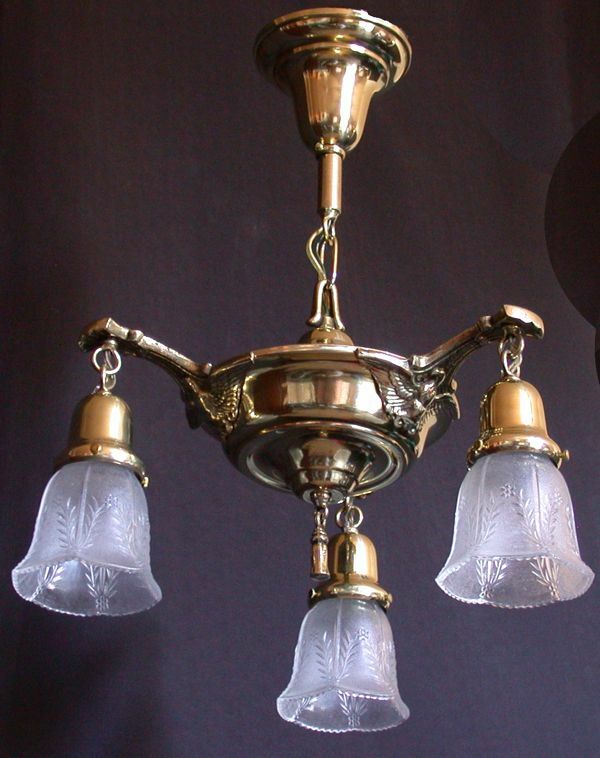 Shown here with period pressed shades. The drop is presently 39 inches and the spread is 31 inches. Item # ELB 363 Phoenix glass bowl with decoration #15 circa 1925. Rod hung, bowl hook holder with three sockets. The drop is shown at 21 inches the spread is 12 inches. 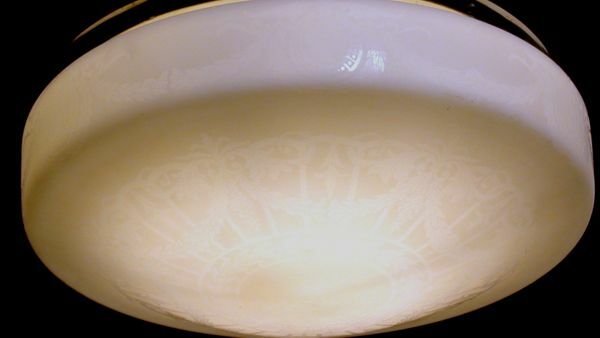 Item # ELB 364 This is a circa 1910, mold blown bowl with acid etched design. Follow this link to view a close up of the detailing on the bowl. Rod hung, bowl hook holder with three sockets. The drop is shown at 20 inches the spread is 12 inches. 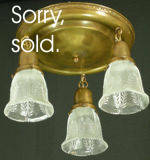 Item # L 10223 Solid brass fixture with aged brass finish and embossed white glass shade circa 1910. The drop is presently, 19 inches and the spread is 8 inches. The drop can be increased if required. Item # ELB 365 pair We have a matching pair of these available. White bisque bowl with blown out swags and bows circa 1910. The drop is shown at 24 inches this can be adjusted. The spread is 13 inches. There are three Edison based sockets. 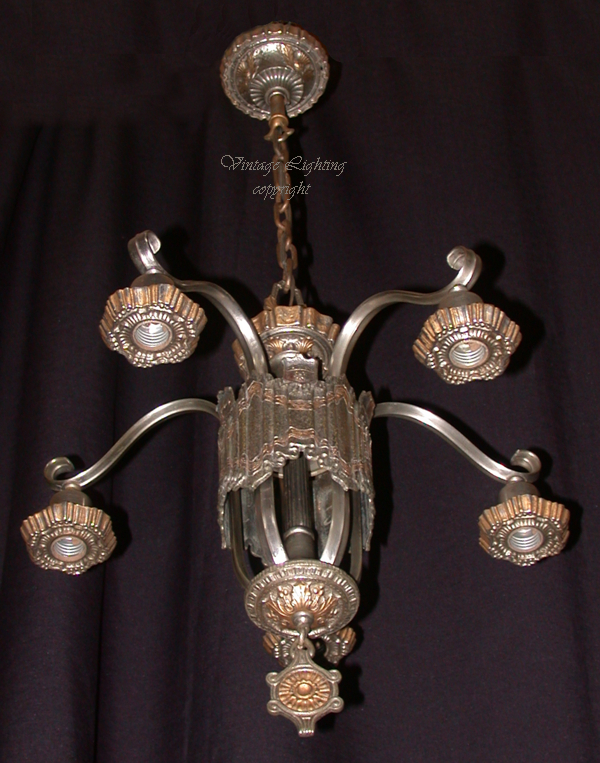 Item # E 544 A silver plated five light fixture circa 1920. The drop is 32 inches and the spread is 15 inches. Item # ES 510 This circa 1915 fixture has period, acid etched, iridescent and cut shades which have strong blue and rose highlights. The drop is shown at 22 inches and can be increased as required. The spread is 14 inches. 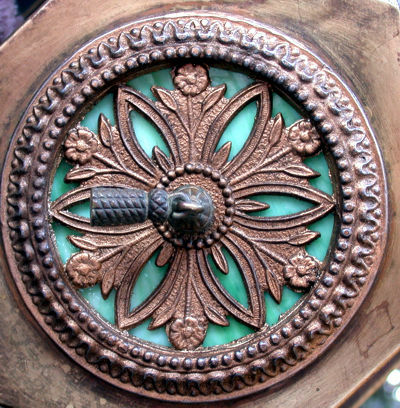 The details are cast brass. Other views are available here. 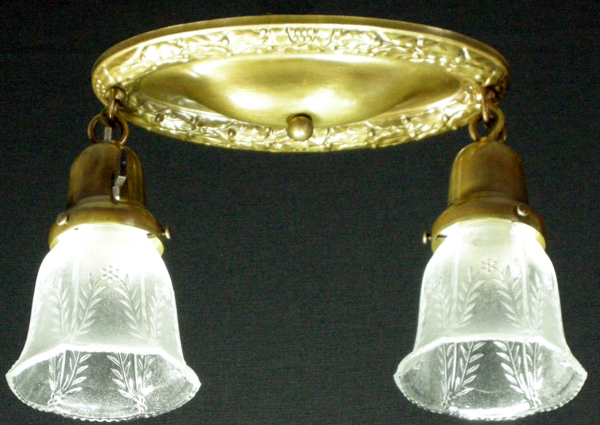 Item # L 10222 Solid brass fixture with matching embossed white glass shade circa 1910. The drop is presently, 20 inches and the spread is 8 inches. The drop can be increased if required. 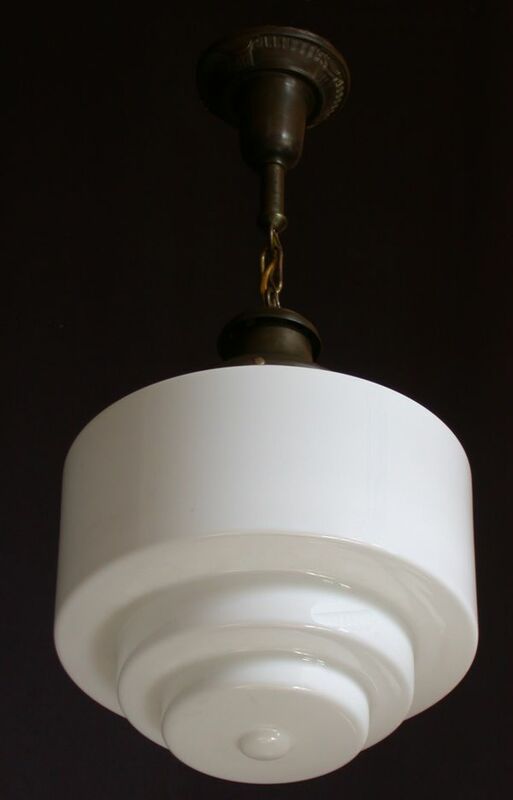 Item # L 10121 A single light fixture circa 1910 with the original stencilled white glass shade. The shade has a 19 inch spread. The drop is presently 26 inches. This can be increased as required. 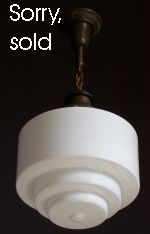 Item # L 10122 A single light fixture circa 1910 with the original stencilled white glass shaded fixture. The shade has a 19 inch spread. The drop is presently 26 inches. This can be increased as required. 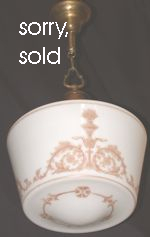 Item # PP 01 A porcelain single fixture with original pink glass shade. The measurements are 9 inch spread 8 3/4'' drop. 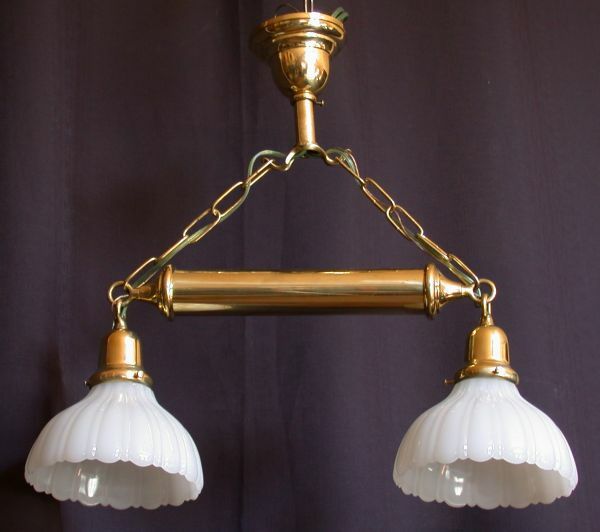 Item # EC 041 A solid brass four light fixture, suspended on four rods with cast brass details, circa 1920.The drop is 35 inches and can be adjusted to meet your requirements. The spread is 18.5 inches. 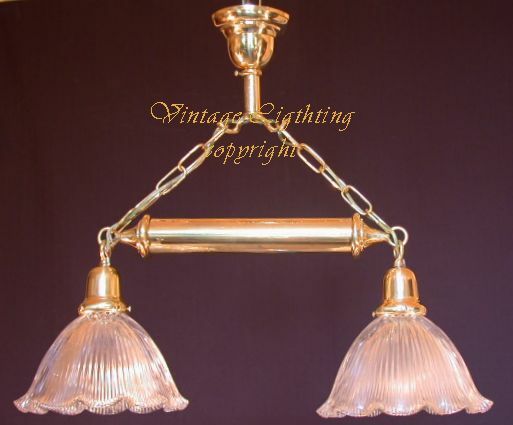 Item # L 10221 A solid brass fixture with white glass panels circa 1920. Close up available here. The drop is presently, 27 inches and the spread is 7 inches. The drop can be increased if required. 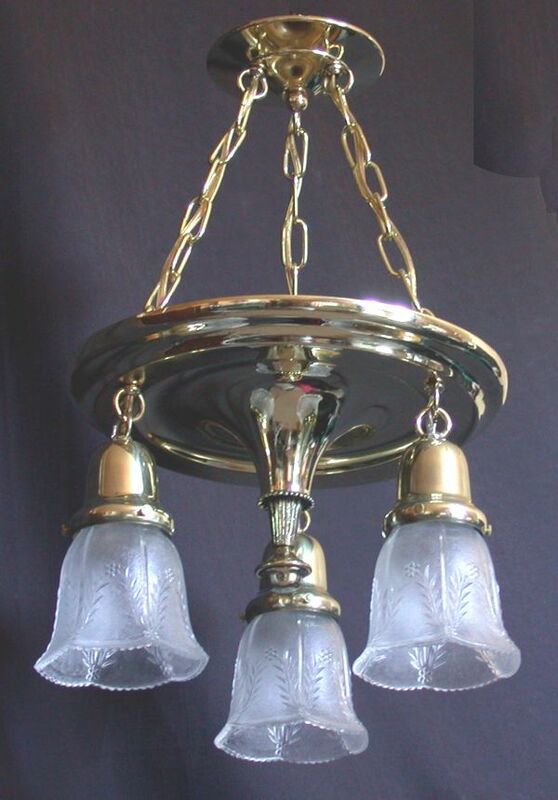 Item # L 122 This mold blown glass shade with blown out details was made by Consolidated Lamp and Glass circa 1910. The shade is signed and patent dated on the fitter rim. 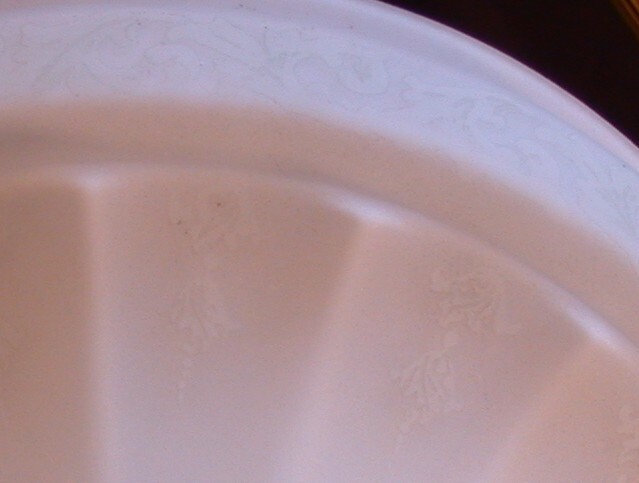 There are two chips, one of which is evident in the larger image. 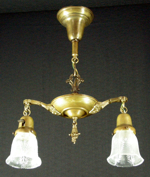 The period fixture has the original aged brass finish. The drop is presently 20 inches and the spread is 12 inches. 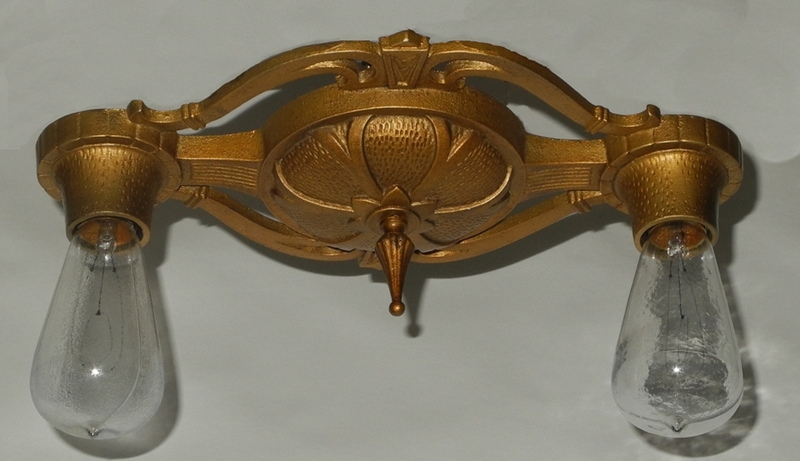 Item # EL 620 This late 19th C gilded bronze fixture has six lights, two in the central part. 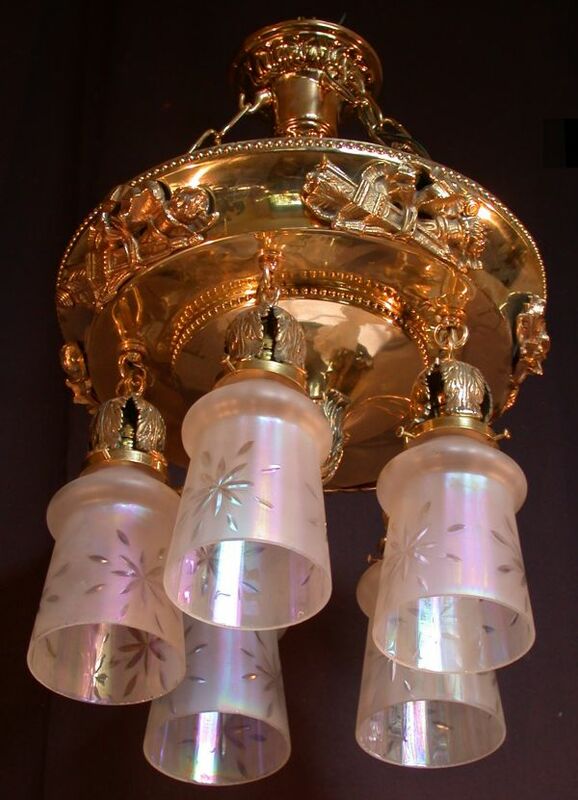 It is adorned with blown glass prisms and iridescent, crystal beaded swags. 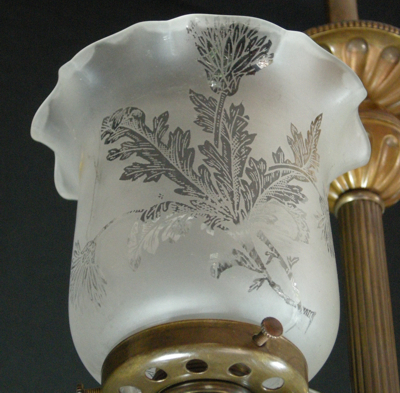 The cast bronze decoration on the fixture is of oak leaves and acorns. This is repeated on the central ring, arms, canopy and a support ring which surrounds the down rods. The drop is presently 43 inches. This can be increased to meet your needs. The spread is 34 inches. 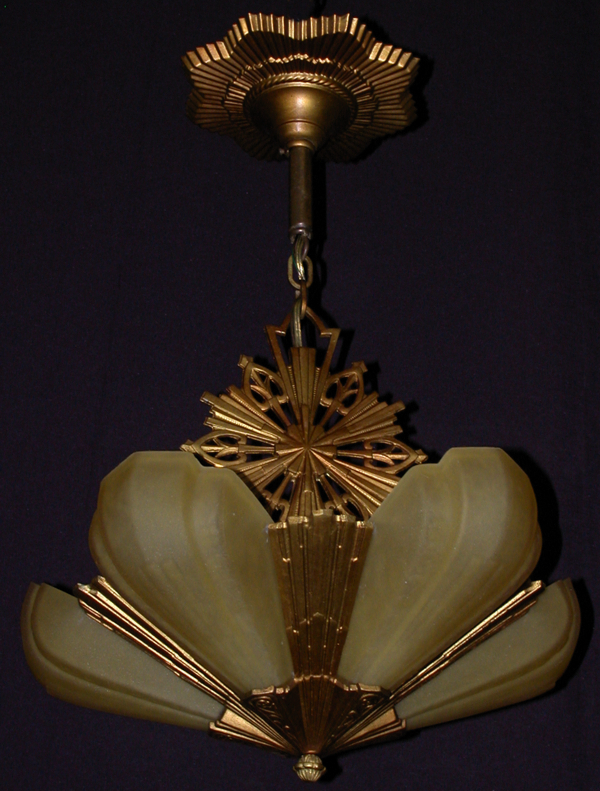 Item # FM 02037 The drop on this piece is 8.50 inches the spread is 15.Solid brass fixture circa 1920. 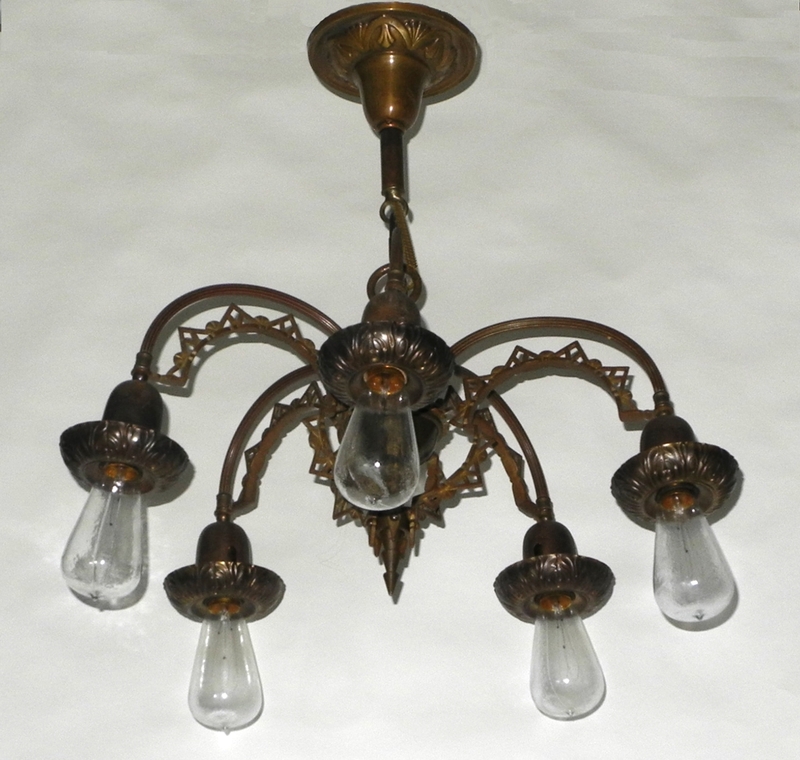 Item # E 02032 A bronze and solid brass five light fixture circa 1920. Very crisply detailed castings. 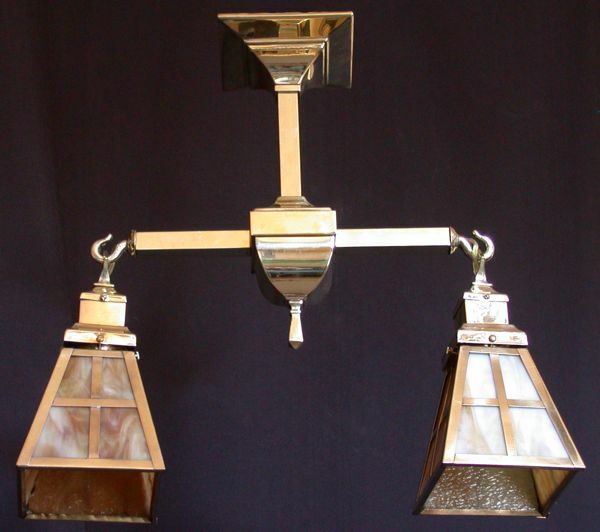 The fixture has a drop of 27 inches as shown and a spread of 20 inches. The drop can be adjusted to meet your requirements. Item # FM 02032 with American made artisanal gold iridescent shades. The drop on this piece with the shades shown is 10 inches the spread is 12. The finish on the fixture is original circa 1910. As shown the fixture is available for $775.00 plus shipping. 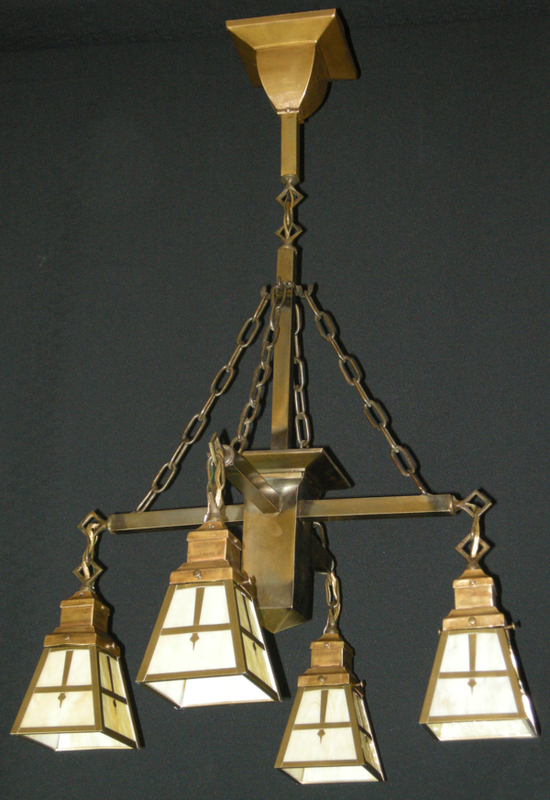 Item# E 09241 We offer a four light solid brass Arts and Crafts Mission style fixture circa 1910 complete with two part shade holders square loop finials, chain and square canopy. The shades are solid brass and caramel slag glass. The drop is 35 inches. The spread is 22 inches. 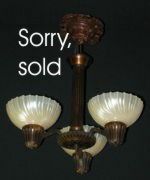 As shown the fixture is available for $ 995.00 plus shipping. Item # P 03 This is a three light porcelain ceiling fixture. The measurements are drop 5.75 inches and the spread 10.5 inches. 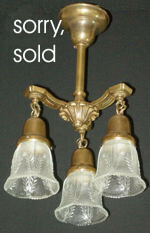 This fixture is from the Canton Line produced 1936 and sold through Lightmaster. 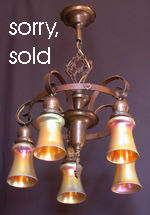 As shown the fixture is available for $195.00 plus shipping. 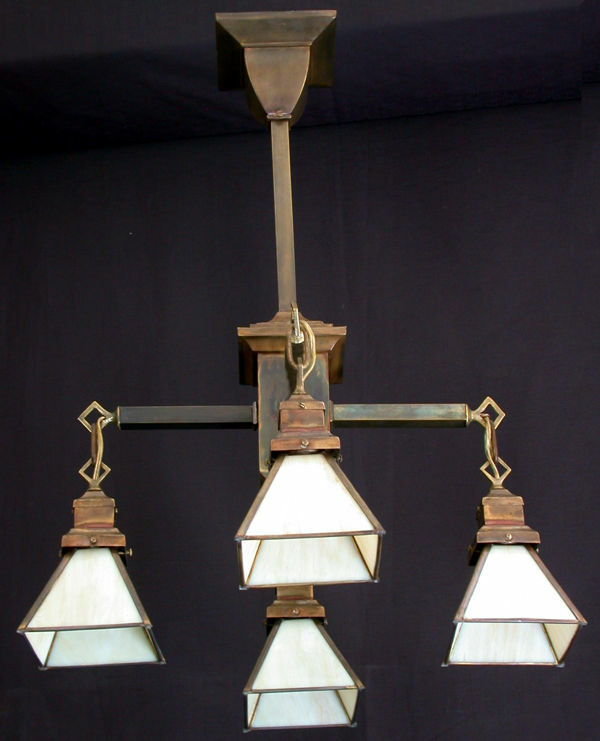 Item # E 11019 A three light fixture shown with original period slag glass shades circa 1910. 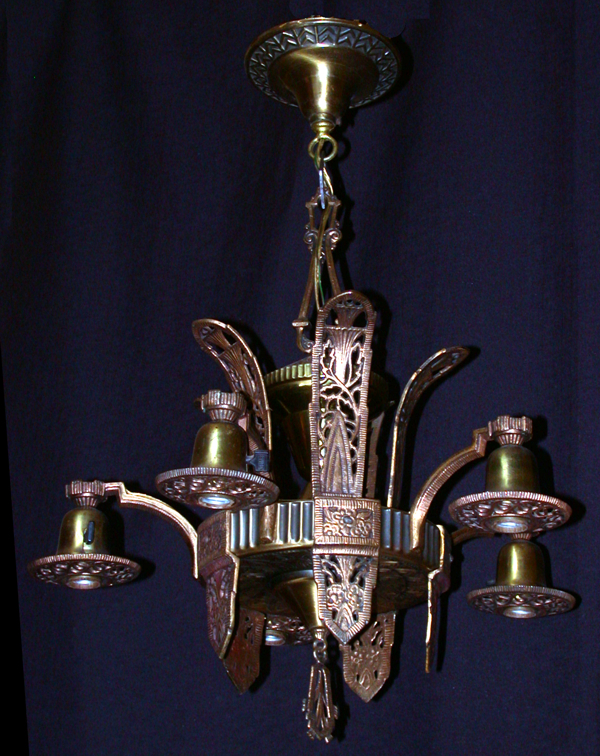 The fixture is shown with the original period aged brass finish. The drop is presently 20 inches and can be adjusted to meet your requirements. The spread is 15 inches. 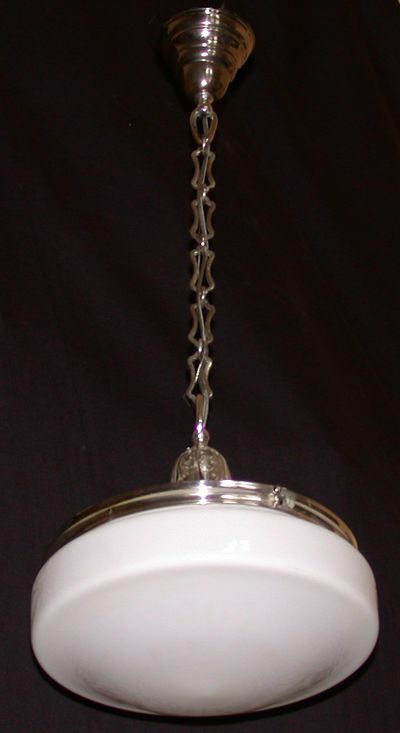 This shower fixture can be mounted as a flush mount fixture if required. 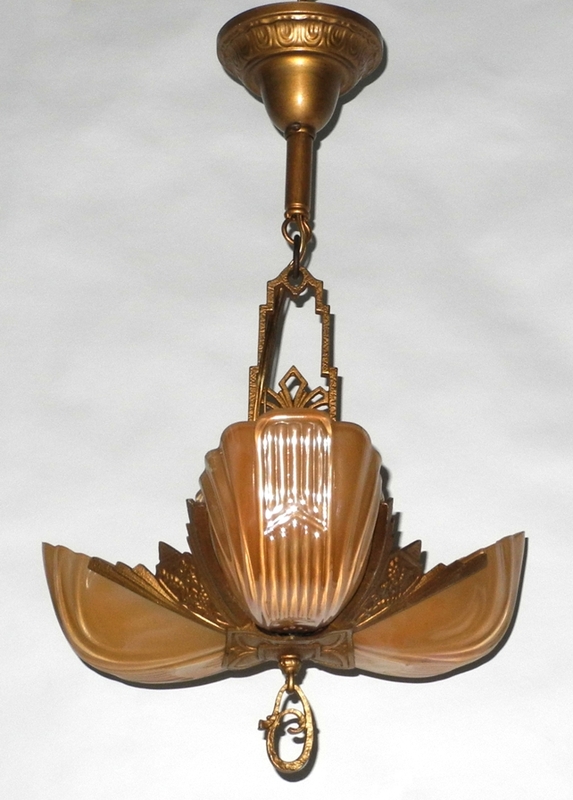 Item # L 02034 A closed hall or porch lantern with caramel slag glass panels circa 1920. 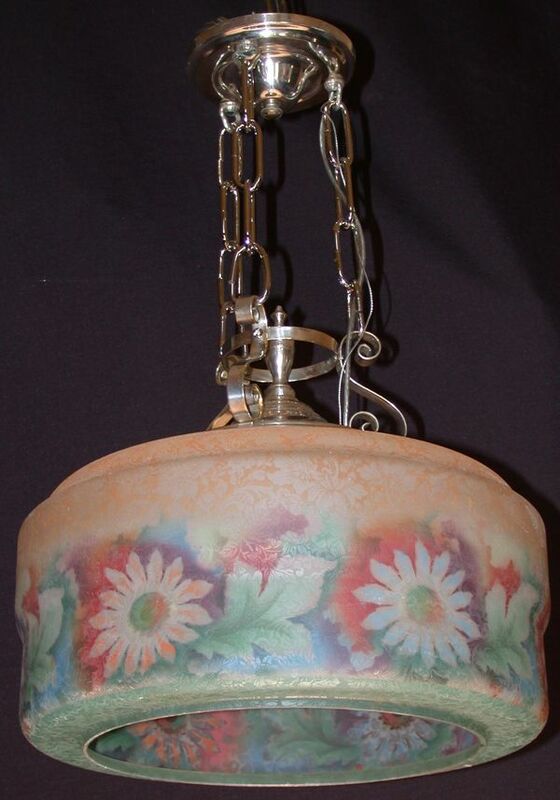 The bottom of the lantern is also glazed to view a close-up follow this link. 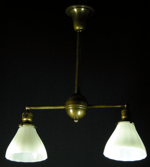 The fixture has a 23 inch drop which can be adjusted if required and a spread of 10 inches. 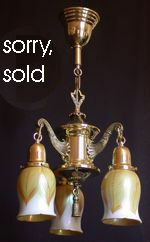 As shown the fixture is available for $495.00 plus shipping. 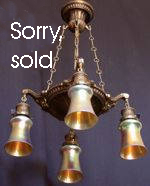 Item # L 11022 Circa 1910 cast brass fixture with period opal glass shade. The drop is 47 inches and the spread is 10 inches. 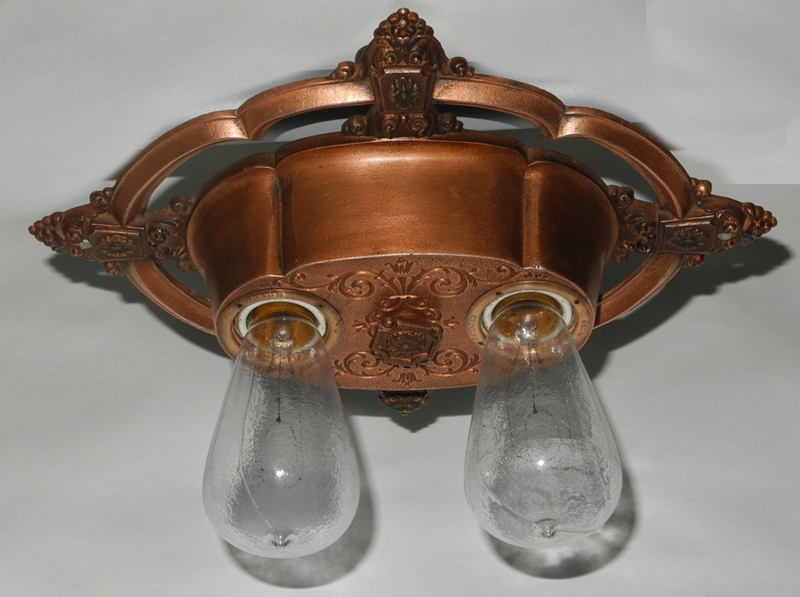 Item # E 02033 A copper wash five light fixture with cast glass shades 1930s. The drop is 17 inches and the spread is 18 inches. The drop can be increased to suit your requirements. 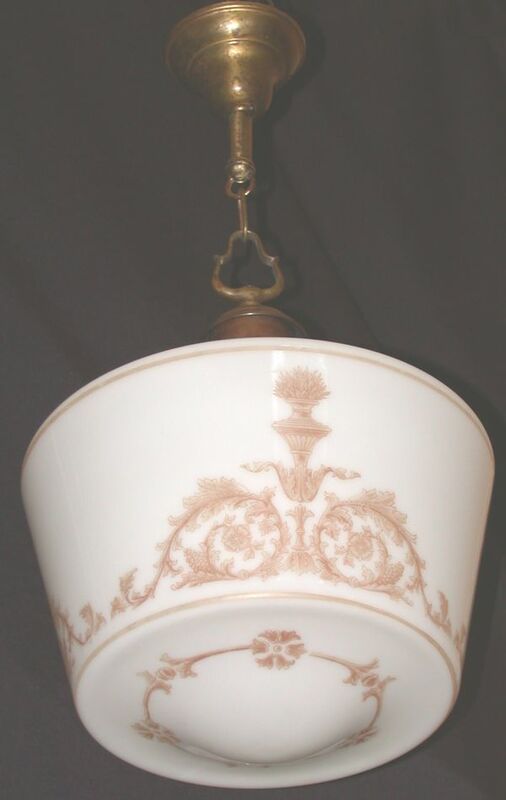 Item # L 152 A caramel stencilled white glass shade, shown here with an aged brass holder circa 1920. The drop is 22 inches and the spread is 16 inches. The drop can be increased to meet your needs. Item # E 11023 We have a pair of these circa 1910 two light chain hung fixtures. Shown here with pressed glass daisy and garland shades. 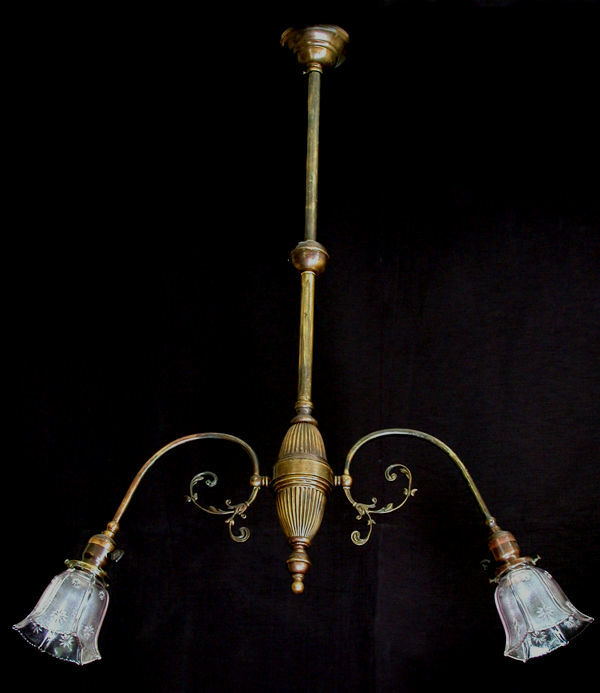 The fixture retains it's original aged brass finish. The drop is presently 29 inches and the spread is 21 inches. 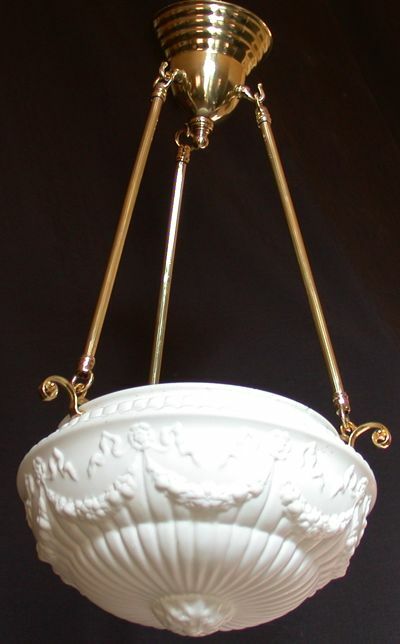 Item # ELB 16'' 401 This inverted dome or lighting bowl fixture holds four lights. 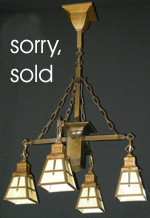 The fixture original period fixture has an aged brass finish. 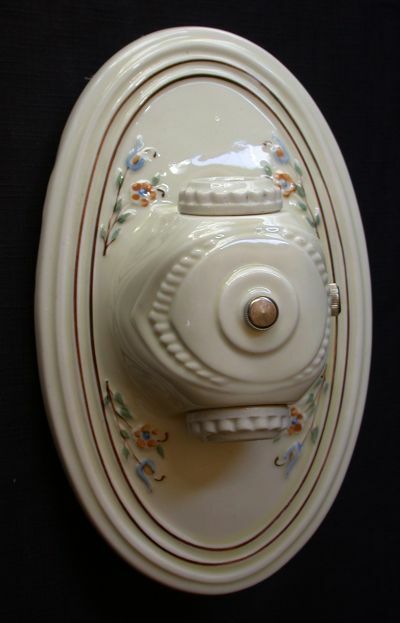 The white bowl has nutmeg stained highlights on the centre medallion and around the border. 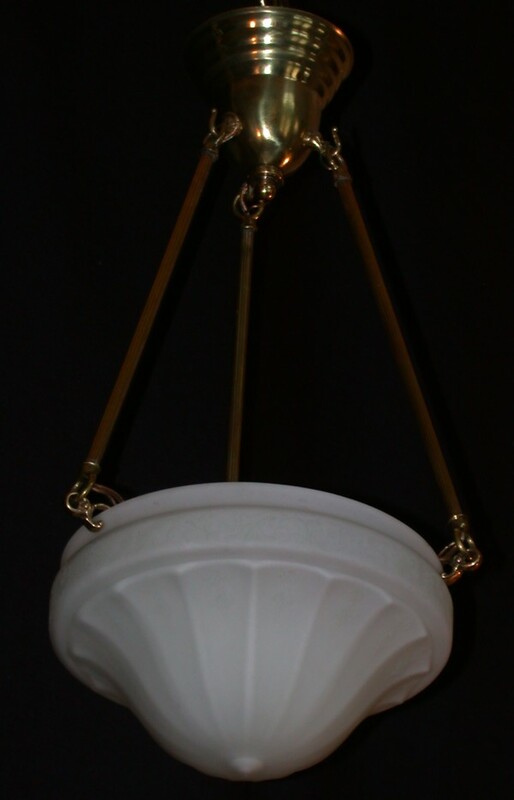 The fixture has a drop of 23 inches and a spread of 16 inches. 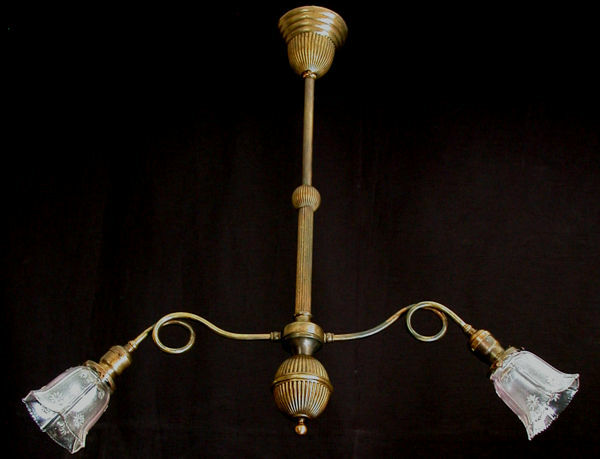 Item # EC 503 A polished brass five light electric fixture circa 1920. The drop is 23 inches and the spread is 17.5 inches. 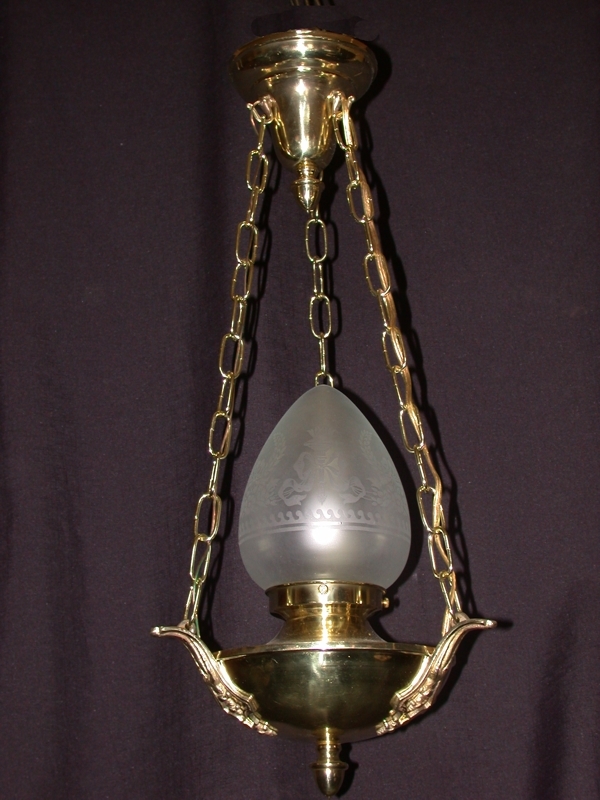 Item # L 031 A circa 1910, single light, solid brass, urn shaped fixture with polished finish. The drop is shown at 24 inches. The spread is 10 inches. 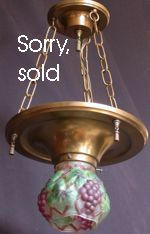 The signed Vianne shade has both laurel wreaths and torch motifs. 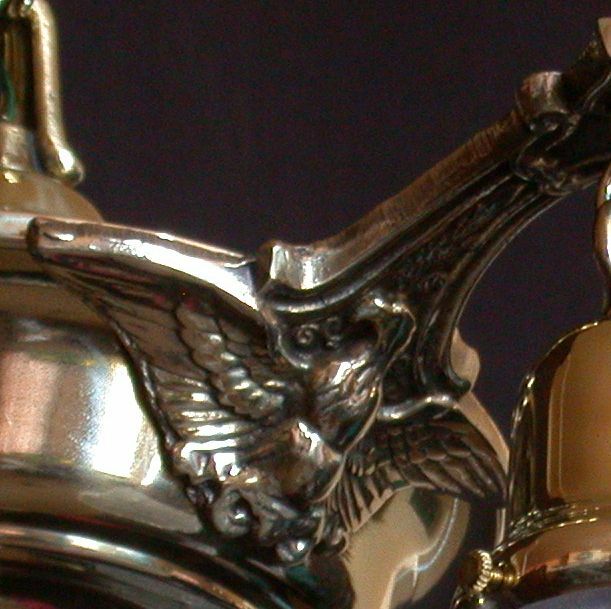 The cast brass arms also have torch details. 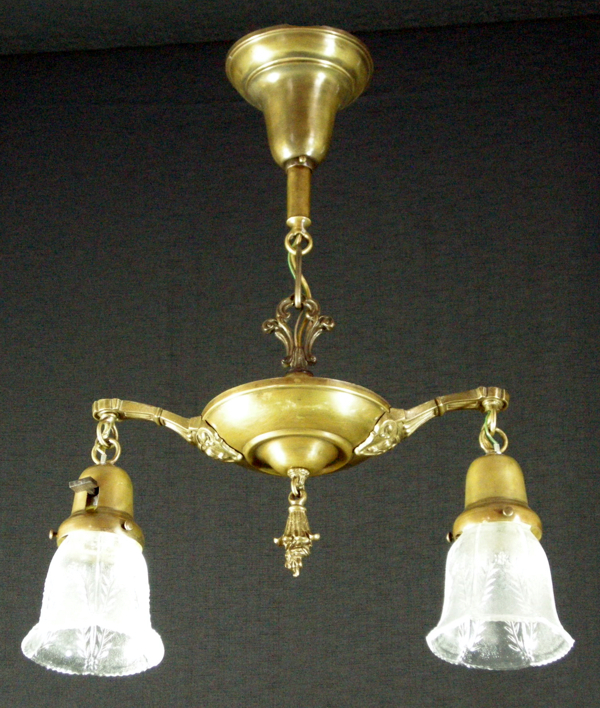 Item # EP 0431 A three light pan fixture circa 1919 with cast brass eagles on the arms. 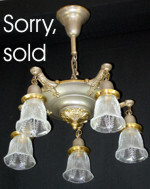 It is fitted with replacement pressed glass shades in a daisy and garland pattern. The drop is presently 27 inches and the spread is 17 inches. The drop can be adjusted to meet your needs. 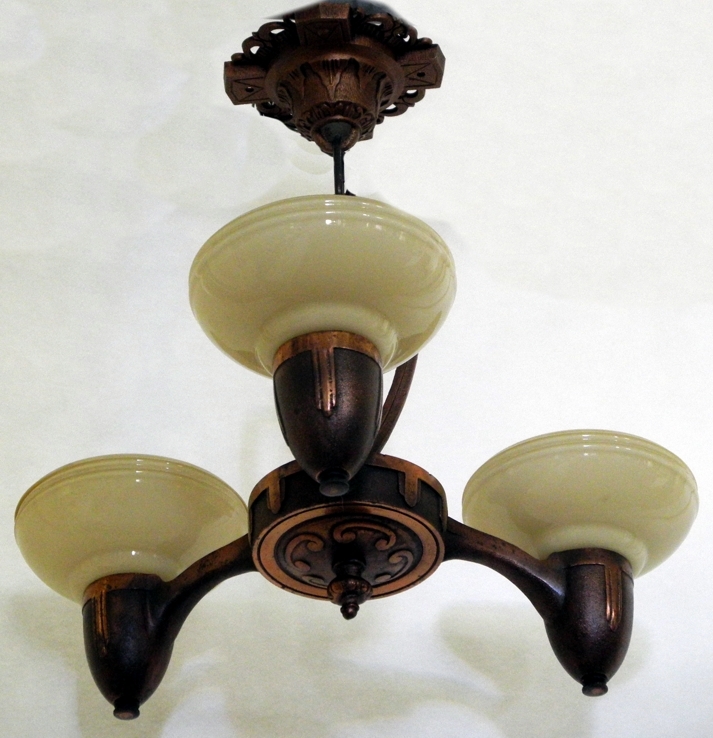 Item # EP 045 A four light pan fixture circa 1919. 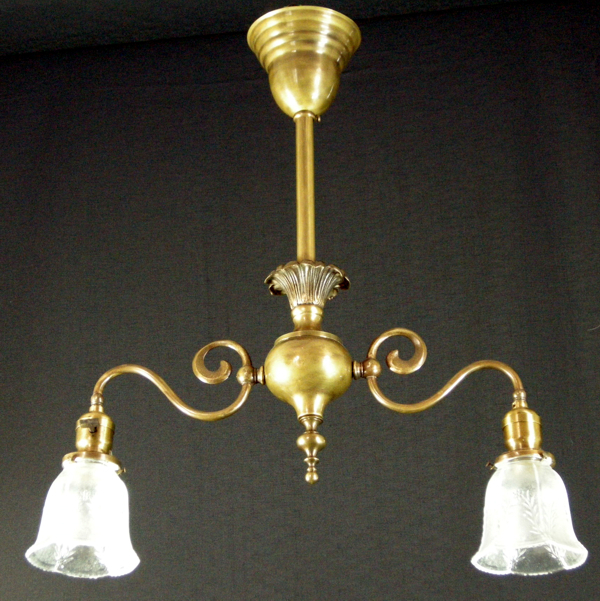 Solid brass with cast brass arms and loop finial good crisp details. 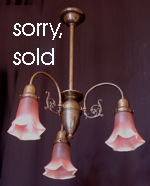 Shown here with replacement pressed glass shades. The drop is presently, 27 inches the spread 20 inches. 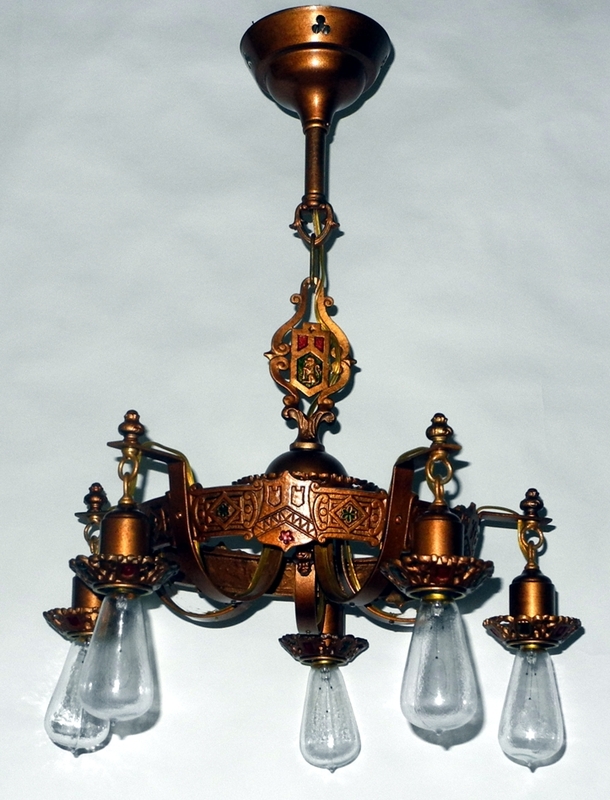 Item # E 042 A four light spelter fixture circa 1910. 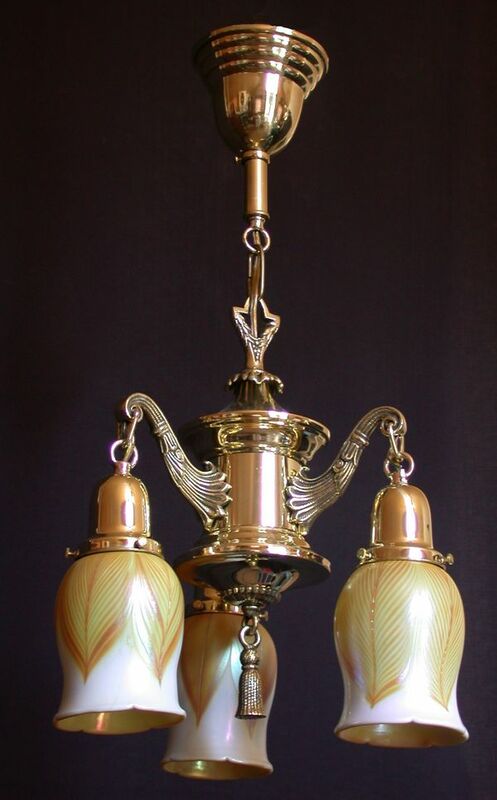 Shown here fitted with American made daffodil shaped gold iridescent shades. 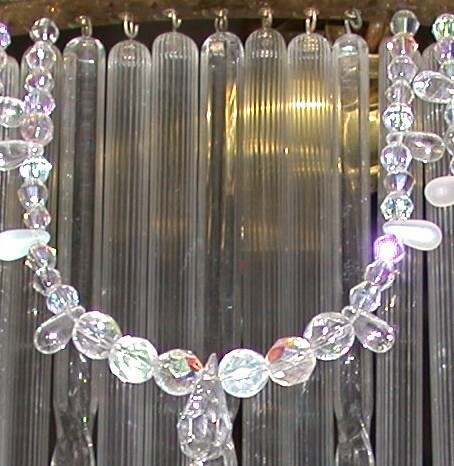 The drop is 27 inches and can be increased with the same chain a further 7 inches or decreased to meet your requirements. The spread is 19.5 inches. Another view is available here. 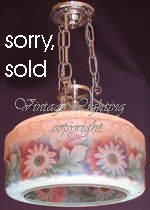 Item # FM 02038 The drop on this piece is 8.25 inches the spread is 14. 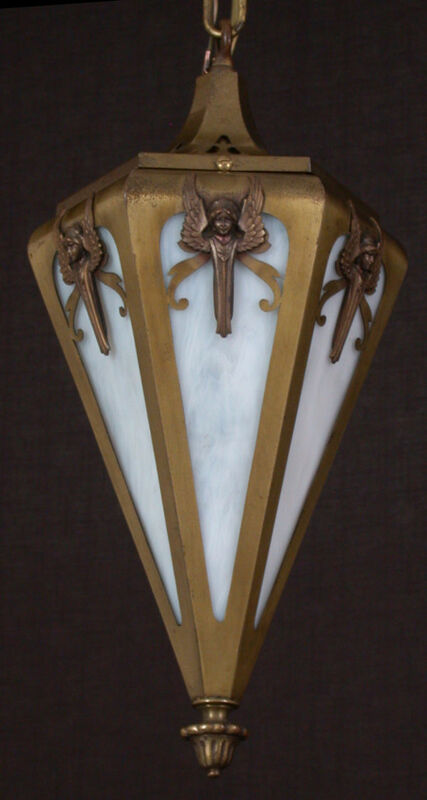 Solid brass fixture circa 1920. Item # P 02 A porcelain flush mounted fixture. The measurements are drop 6 inches and spread 10 inches. As shown the fixture is available for $150.00 plus shipping. 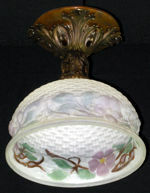 Item # FM 02036 The drop on this piece is 8.25 inches the spread is 10.5. 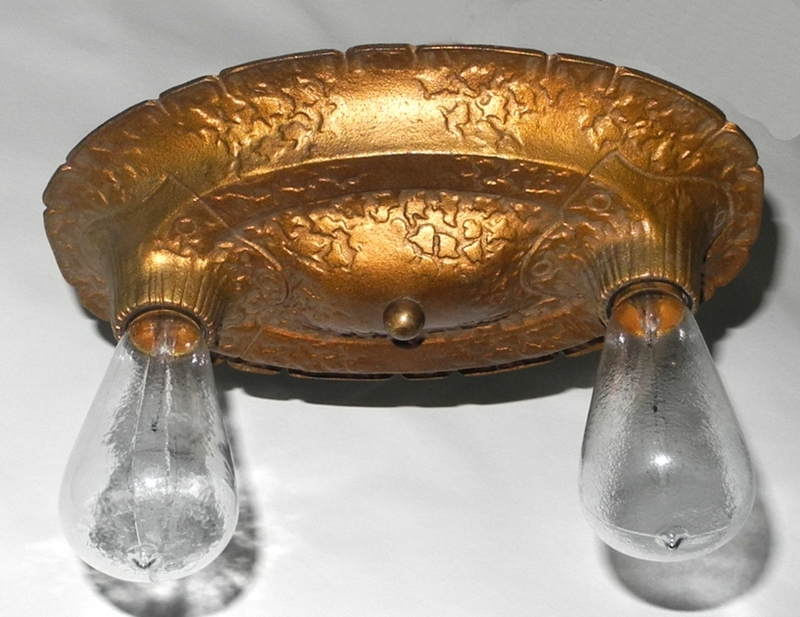 Solid brass fixture circa 1920.. 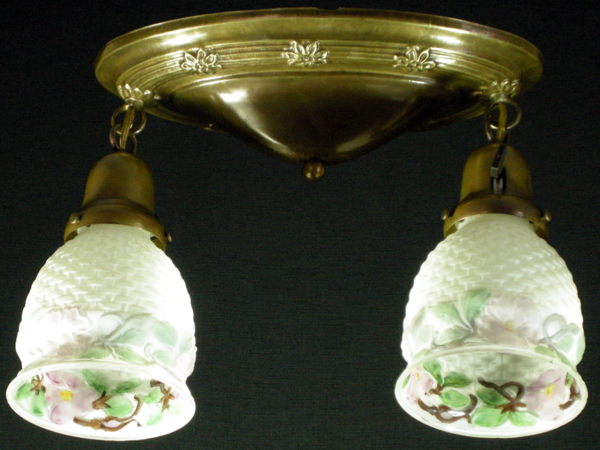 Item # EB 1123 A Bellova reverse painted and deeply etched shade shown with the original silver plated brass holder. The drop is shown at 21 inches this can be adjusted to meet your needs. The spread is 14 inches. 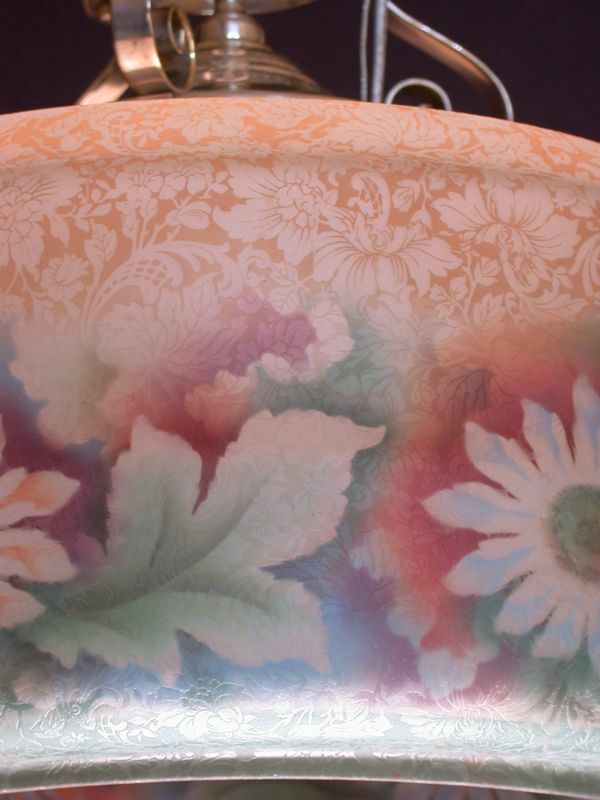 A close up image of the pattern on the shades is available by following this link. Another view of the fixture is available here. 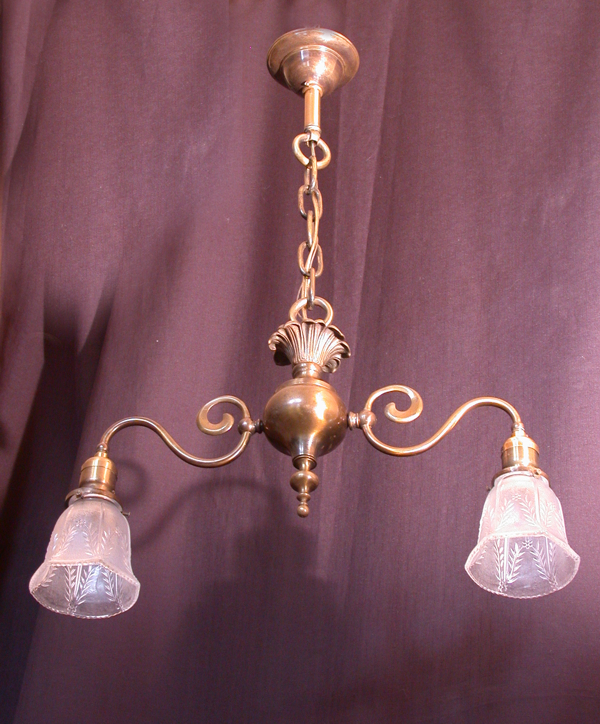 Item # EP 09191 We have a matching pair of these two light solid brass fixtures. The drop is shown here at 18 inches. The spread is 15 inches. 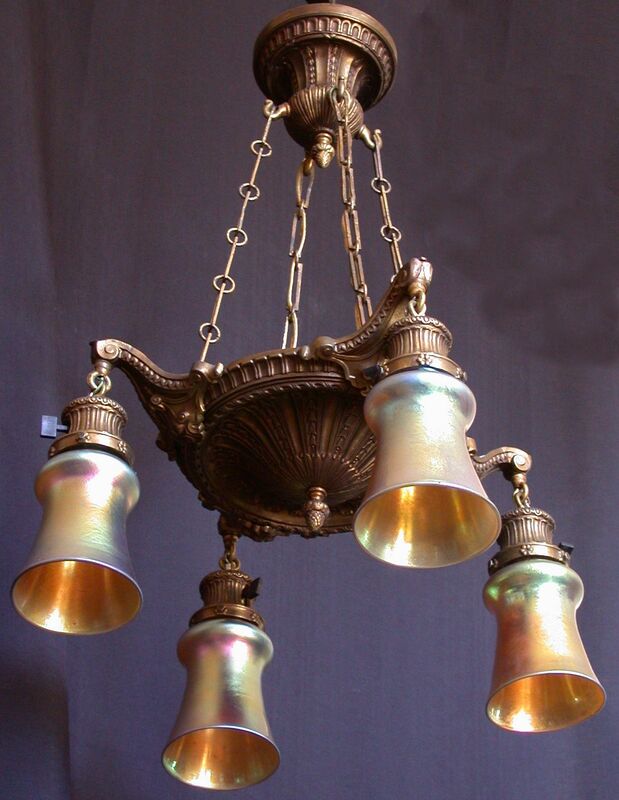 Item # E 431 An unusual four light solid brass circa 1910 fixture shown with contemporary American blown art glass gold iridescent shades. 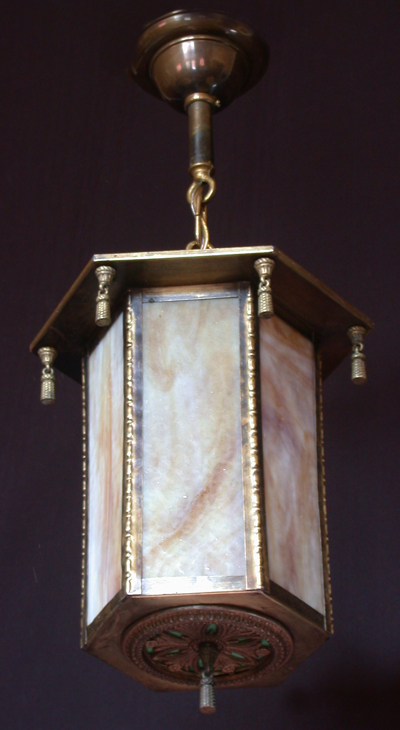 The finish is original aged brass. The drop is presently 26 inches and can be adjusted to meet your needs. The spread is 25 inches with the shades shown. 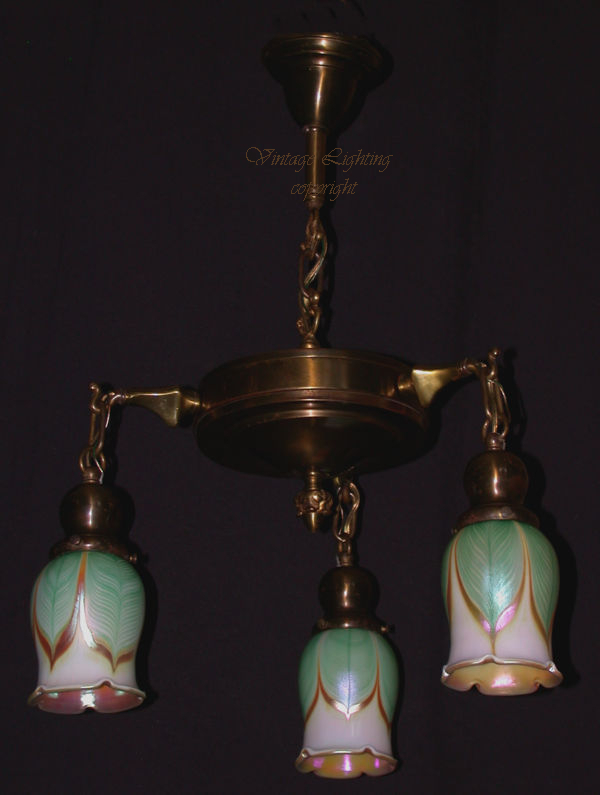 Item # E 11021 A three light pendant fixture circa 1900 shown with pink and opal Vianne shades. 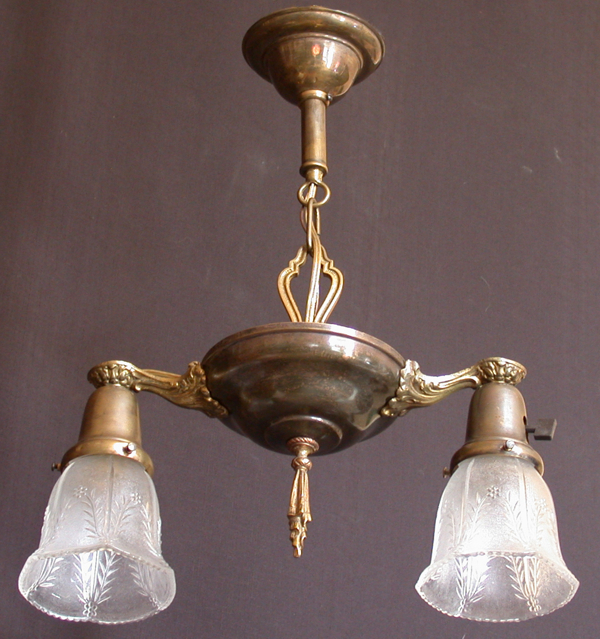 The fixture has the original aged brass finish. Other shade choices are available. The drop is presently 27 inches, the spread 22 inches. 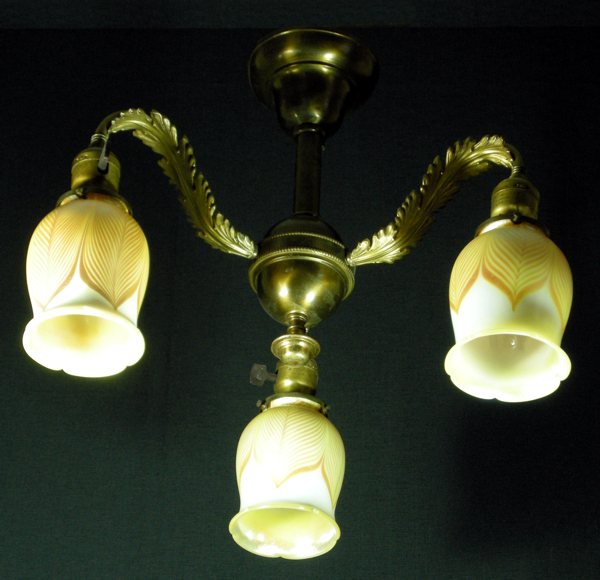 Item # E 09166 A three light Sheffield patterned fixture with matching shades. The shades are etched inside with a glossy finish outside. 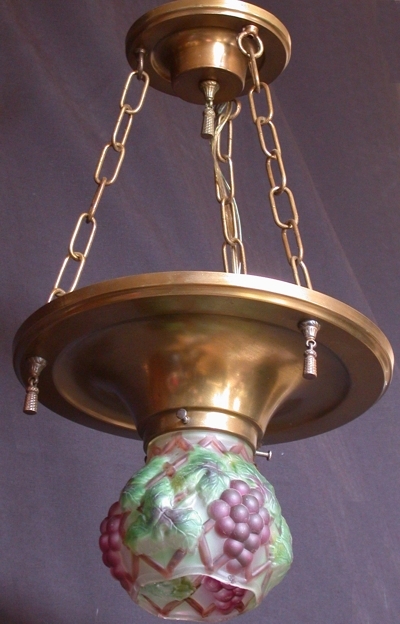 The fixture is shown with the original aged brass finish circa 1910.The drop is presently, 19 inches. The spread is 14 inches. 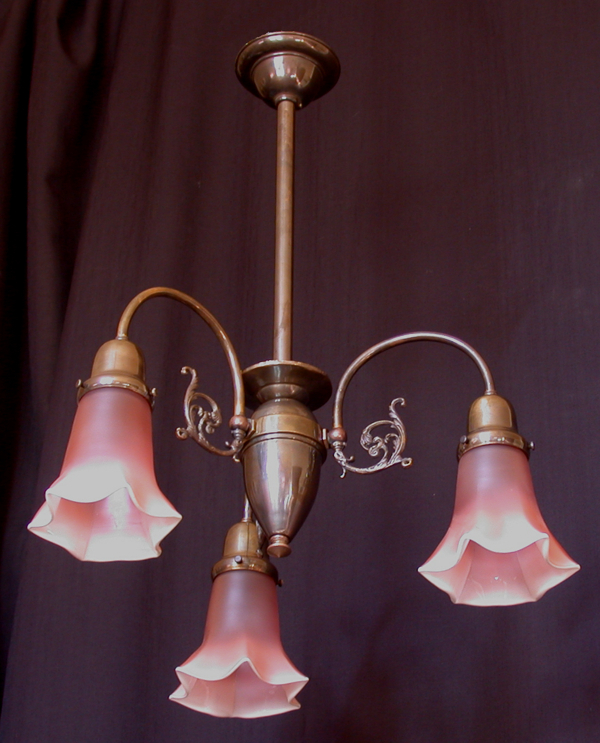 Item # E 11018 A five light fixture with hammered brass detailing circa 1930. 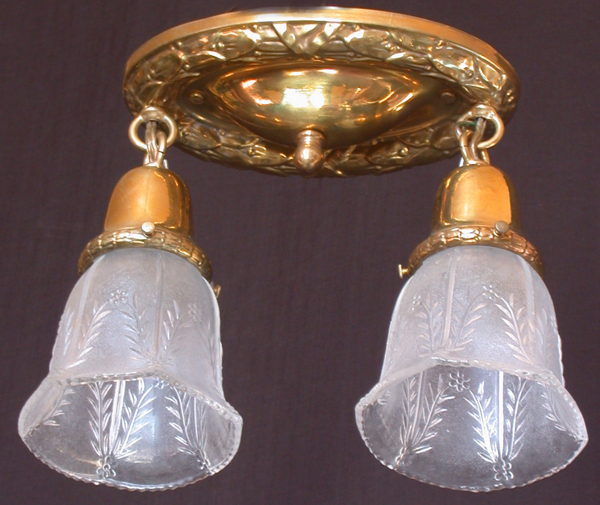 Shown here fitted with American made replacement, daffodil shaped gold iridescent shades. The fixture is presented with the original finish in very good condition. The drop is presently 27 inches, this can be increased if required. The spread is 18 inches. 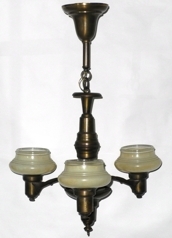 Item # E 0431 A three light circa 1910 solid brass fixture with cast brass arms, loop finial and tassel finial. Shown here with Artisanal, American art glass, replacement shades. The drop is 26 inches and can be increased to meet your requirements. The spread is 16 inches. 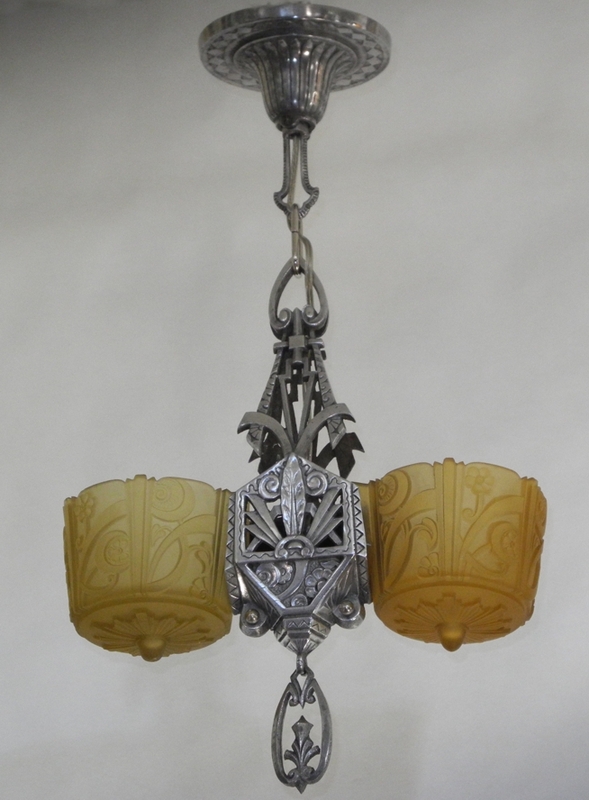 Item # L 043 We have a pair of these pendants circa 1920 with nickel fixtures. The drop is 21 inches, this can be increased to meet your needs. The spread is 10.5 inches. Item # LK 101 This mold blown glass shade with blown out details was made by Kopp circa 1928. 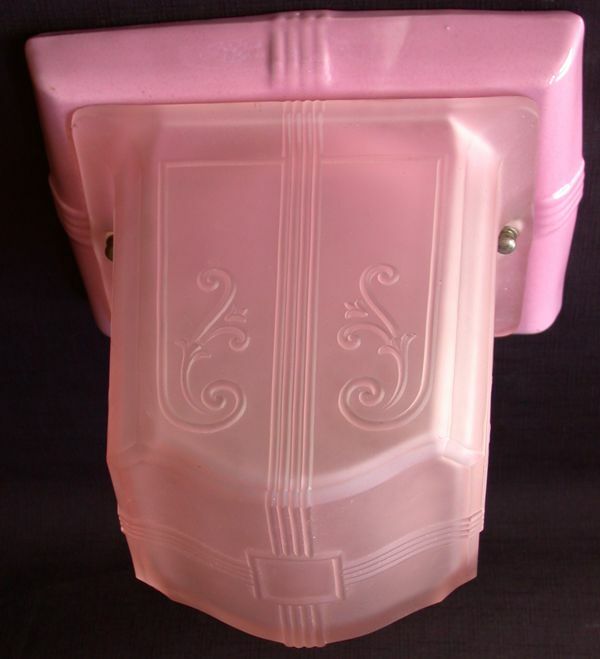 It is shown here with a period four inch holder. The drop is presently 20 inches and the spread is 11 inches. 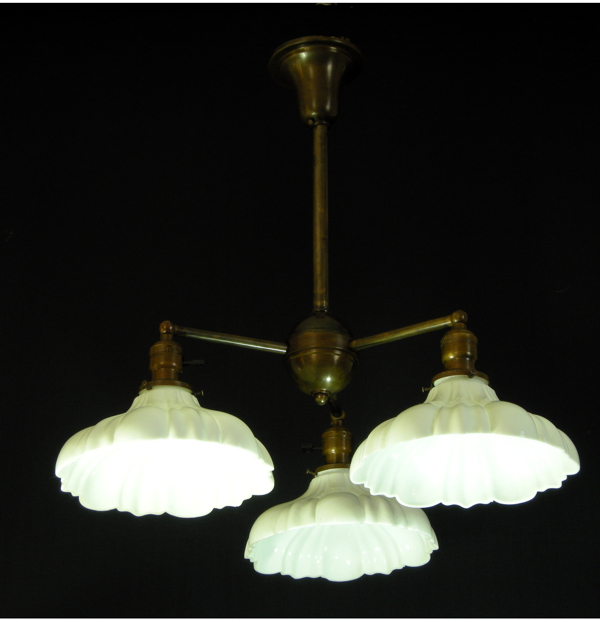 Item # E 0430 A three light flush mounted solid brass fixture. 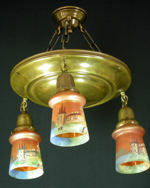 Shown here with replacement pressed glass shades. The drop is 7.5 inches and the spread is 12 inches. As shown this fixture is available for $375.00 plus shipping. 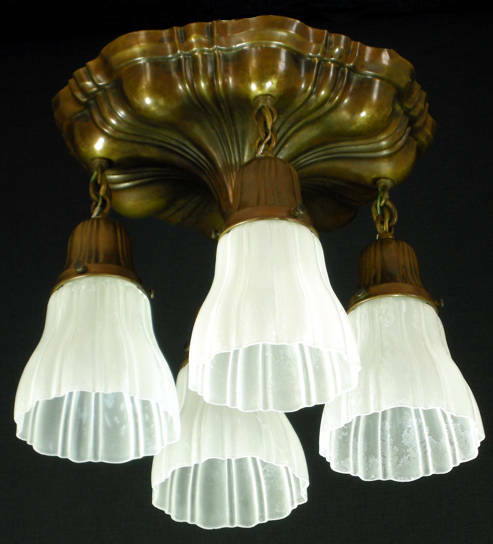 Item # E 4124 A four light fixture circa 1900 with double etched Vianne shades. 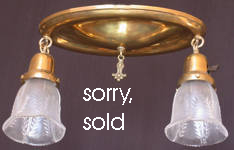 We also have two pair of matching wall sconces available. 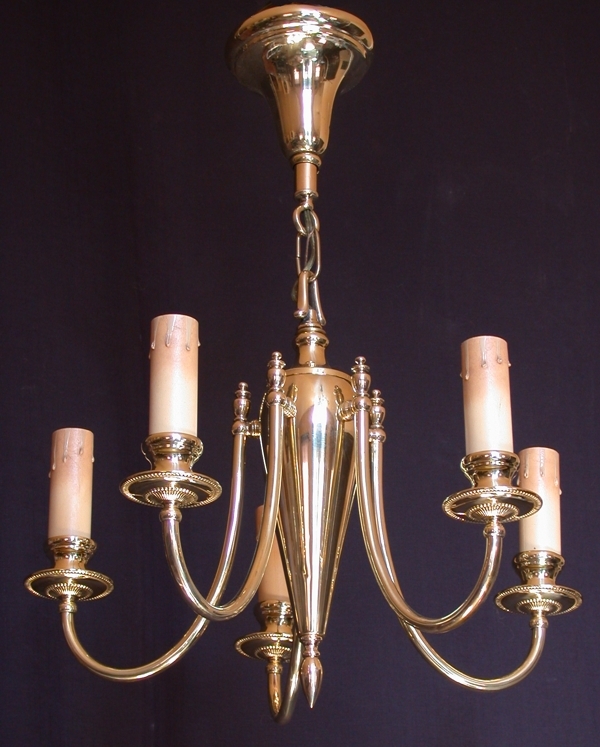 The fixture, presently, has a drop of 29 inches which can be adjusted to meet your needs. 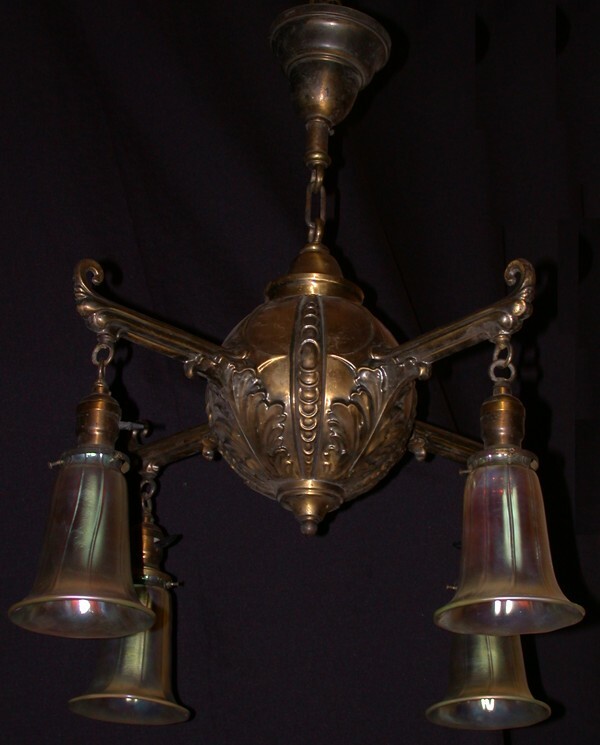 Item # L 4011 We have four of these circa 1920 Holophane fixtures with nickel plated solid brass holders and four original clips. 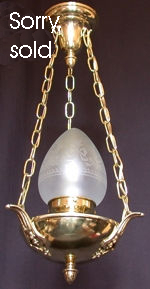 The open bottom allows for bulb changes without removing the shade. They are shown with a drop of 35 inches, this can be adjusted to meet your needs. The spread is 12 inches. 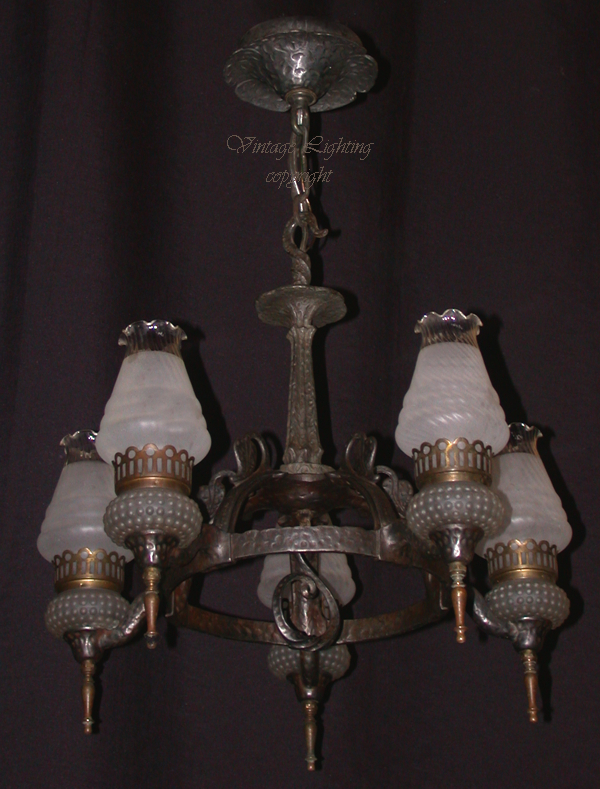 Consolidated Lamp and Glass Company was formed in Fostoria, Ohio in 1893 from the merger with Fostoria Shade and Lamp Company. 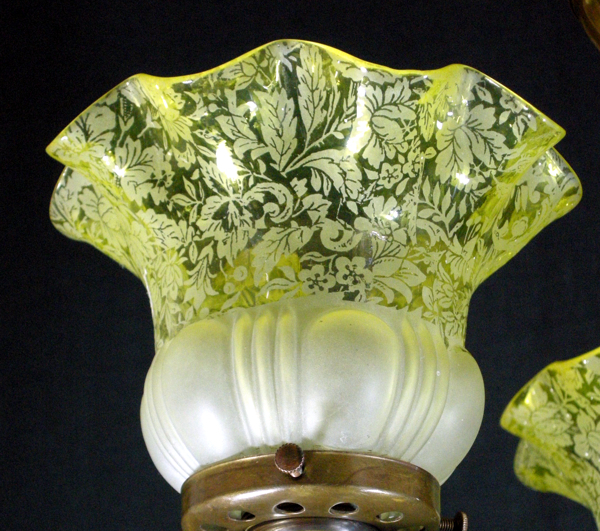 In the 1890's they produced some art glass in other shapes, but for many years their main production was high quality lamps and shades.